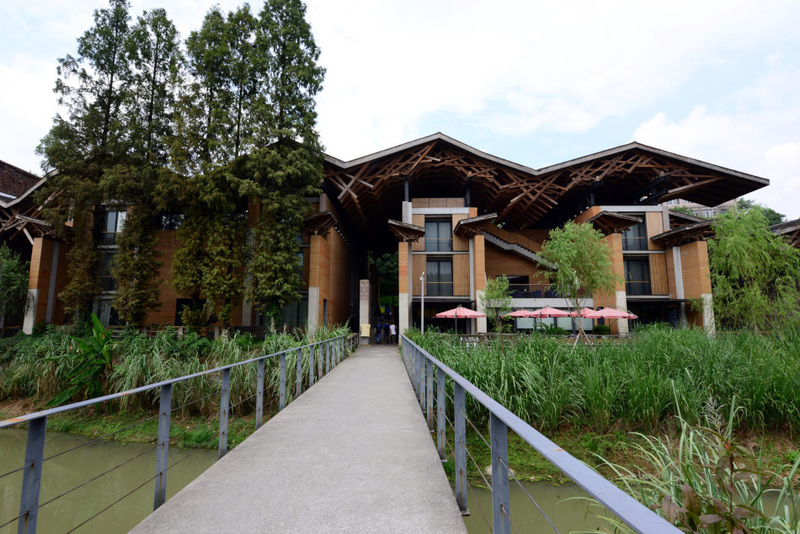 Before we left the Xiangshan campus, we dropped by the new Folk Art Museum. 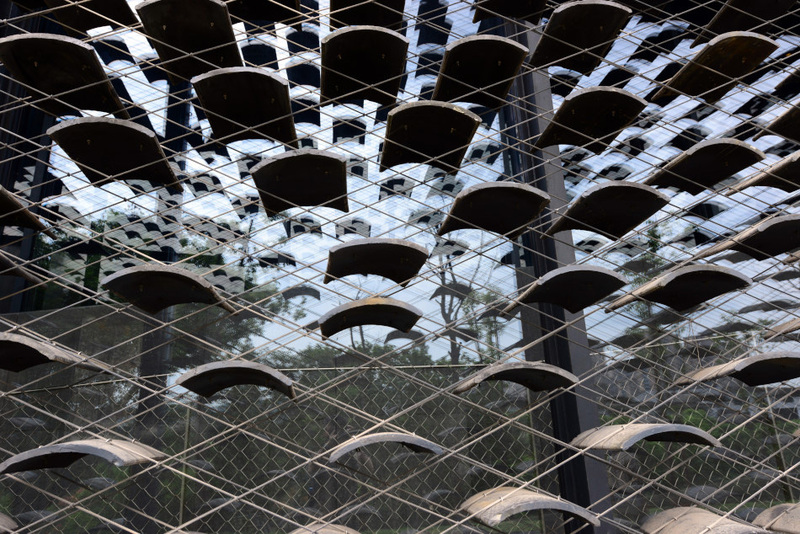 Designed by Japanese architect Kengo Kuma, the Folk Art Museum is the latest addition to the campus. Similar to Wang Shu, Kengo Kuma’s work has long been considered as a contemporary representation of the essence of traditional architecture. 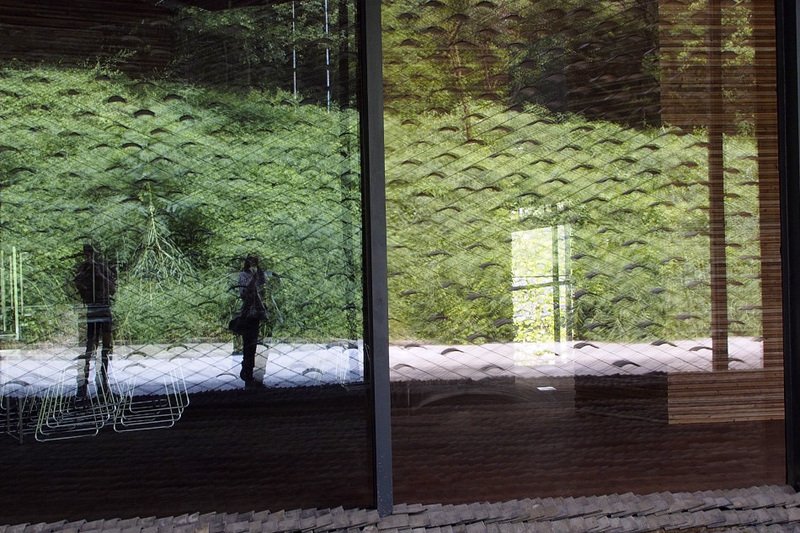 Last year when we were In Tokyo, we visited Kengo Kuma’s Suntory Museum of Art and Nezu Museum, and immediately fell in love with Kengo Kuma’s clever interplay of light and shadow, magnificent treatment of transitional spaces between interior and exterior, poetic arrangement of circulation spaces and contemporary interpretation of traditional Japanese architecture. 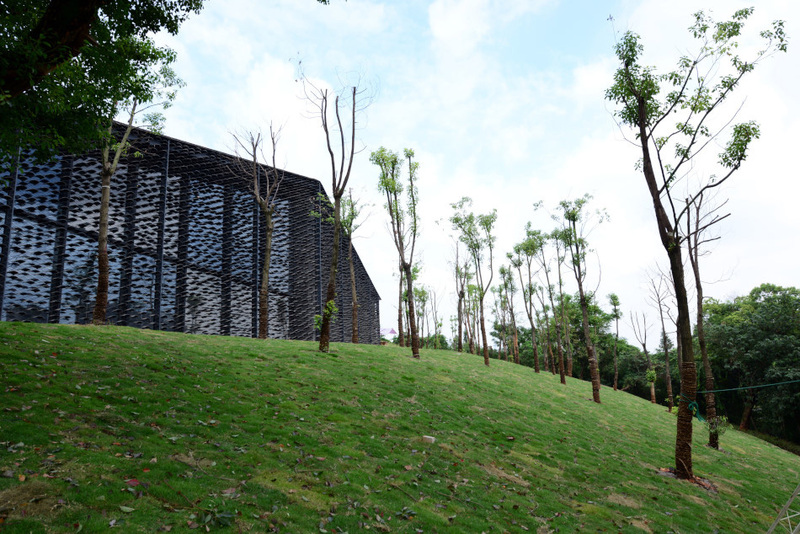 The Folk Art Museum at Xiangshan sits against a hill like a series of overlapping parallelograms. 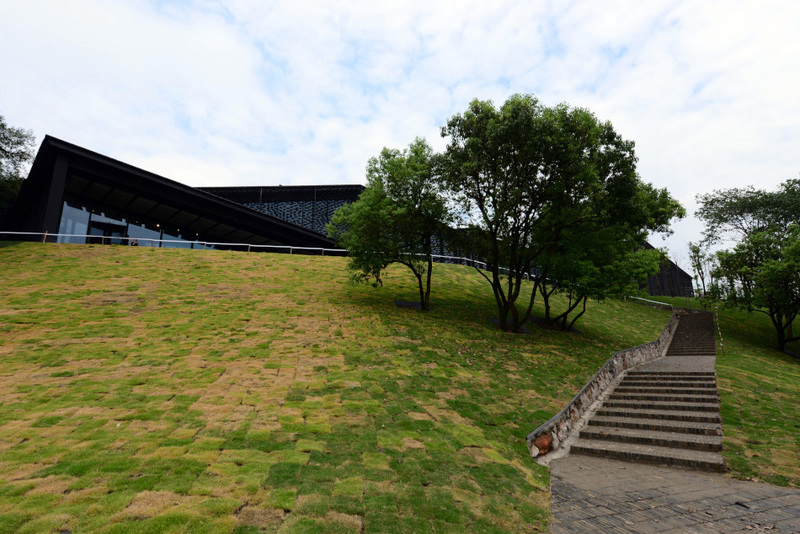 Aligned with Kengo Kuma’s principle “to recover the place”, the spirit of the sloped landscape is carefully maintained with the cascade arrangement and ramp circulation of the building. Old roof tiles are extensively used as roofing and also an outer screen outside the glass walls of the building. The tiles serve the purpose as shading device by casting a myriad of floating shadows in the interior. Their existence provokes a poetic atmosphere made of light and shadow. Before our trip, we were delighted to find out that the Folk Art Museum would be ready to open its doors two days before our visit. Unfortunately, when we arrived at its door, all we could see was an empty building with several installation workers inside the building. All we could do was walk around the building and ascend to the accessible roof via a long flight of exterior stair that penetrates the museum in the middle. After our visit to Xiangshan, we took the public bus back to Downtown Hangzhou. 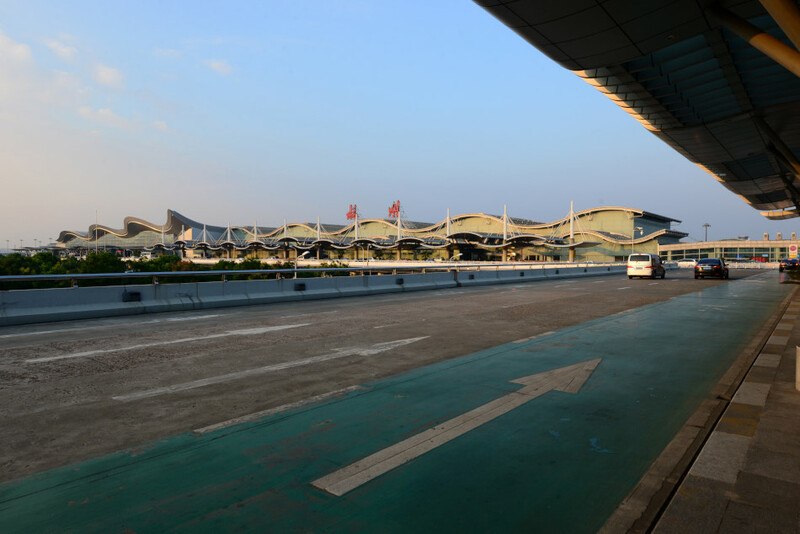 We returned to the hotel to pick up our bags, took a taxi to the airport bus station, and hopped onto the bus for Hangzhou International Airport. When we get off, the yellowish afternoon sun and a banner promoting a new direct flight from Hangzhou to Copenhagen greeted our arrival at the airport. It wasn’t too busy in the airport concourse and we had plenty of time after checking into the waiting zone, reviewing our photographs in the cameras while waiting for our Dragon Air flight back to Hong Kong. This concludes our 5-day visit to Anhui and Hangzhou. The pathway that leads up to the museum entrance and entrance forecourt. After we walked up the stair to the upper part, we reached a platform and a secondary entrance of the museum, and a stair that leads further up to the roof. Upper platform of the complex. A peek into the museum interior from the upper platform. Our reflection on the glass wall of the museum beyond the screen of tiles. 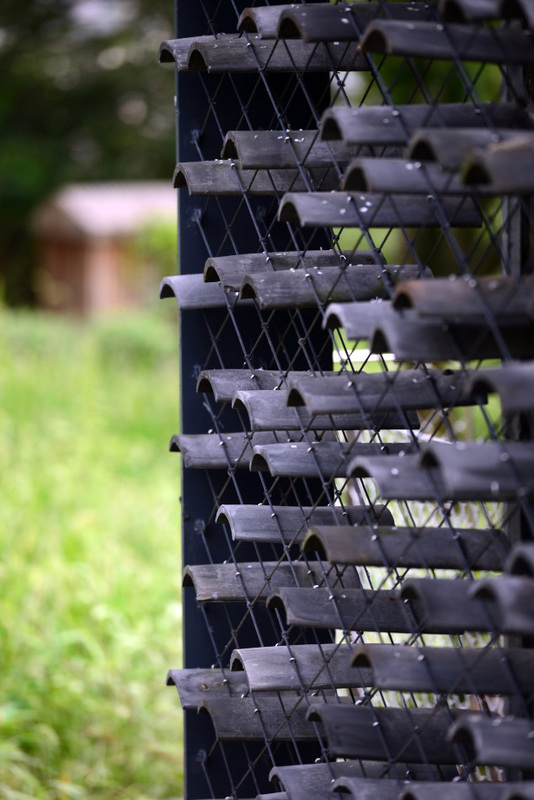 Dark tiles are clipped with tiny hangers onto the diamond shaped wire system. Space between the outer screen of tiles and the inner layer of glass windows. Second stair that leads to the upper roof. 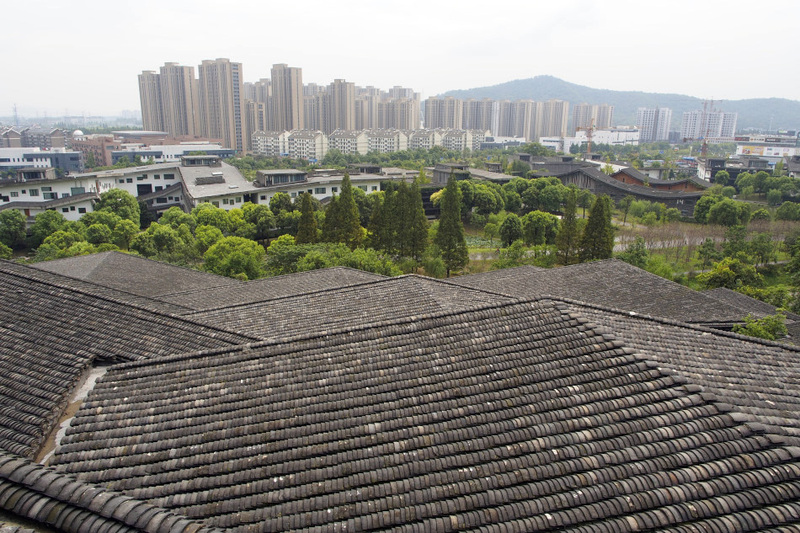 View from the upper roof down to the Xiangshan campus and beyond. Layers of sloped tiled roofs produce the unique minimalist form that resembles undulating terrain of natural landscape. Sometimes, the tiles seem like floating in mid air. We were forbidden to visit the museum interior, we had no choice but to return back down to the main campus after a walk around the Folk Art Museum. It was late afternoon when we arrived at Hangzhou Airport for our flight home to Hong Kong. The bus ride from Huangshan to Hangzhou took about 4 hours. By the time we checked into our hotel near West Lake in Hangzhou it was already dinner time. After a good night of rest for our legs, in the morning we decided to visit the Xiangshan Campus (象山中心校區) of China Academy of Art (中國美術學院) in the outskirt of Hangzhou. We grabbed a Chinese pork bun and walked to the waterfront promenade by West Lake. We stood by the waterlilies and finished our simple breakfast. Soon we walked over to the nearby bus stop and took a local bus heading to the direction of Xiangshan. The entire bus journey took a little over half a hour. Contemporary architecture was the reason for our visit to Xiangshan, and was our only major activity planned for our brief stay in Hangzhou. Wang Shu (王澍), dean of the School of Architecture at China Academy of Art, is one of the most well known Chinese architects. 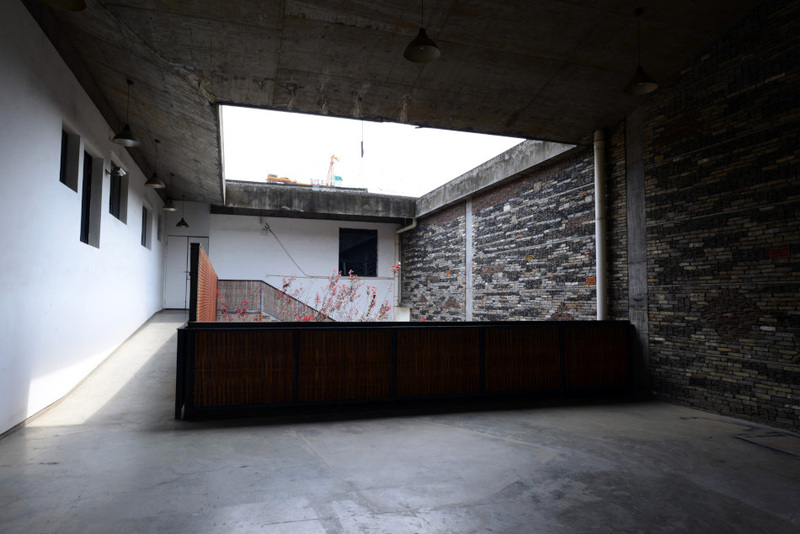 In 1997, he and his wife Lu Wenyu (陸文宇) found their firm Amateur Architecture Studio. 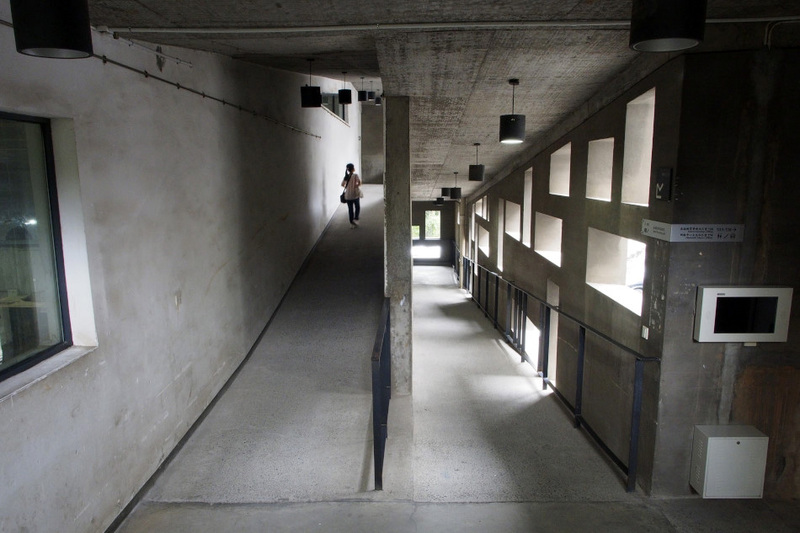 The couple had been teaching at the School of Architecture at China Academy of Art ever since 2000. 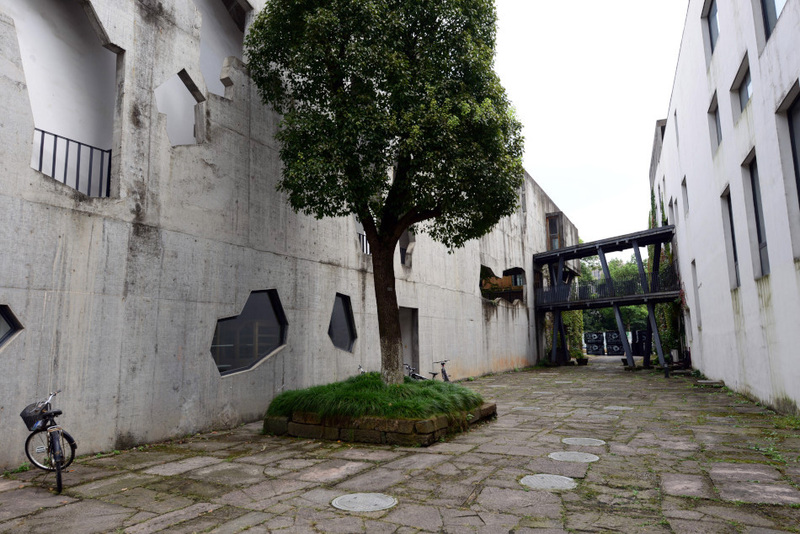 Based in Hangzhou, their works represent a unique critical regionalism, deriving their own architectural character with contemporary reinterpretation of local heritage. 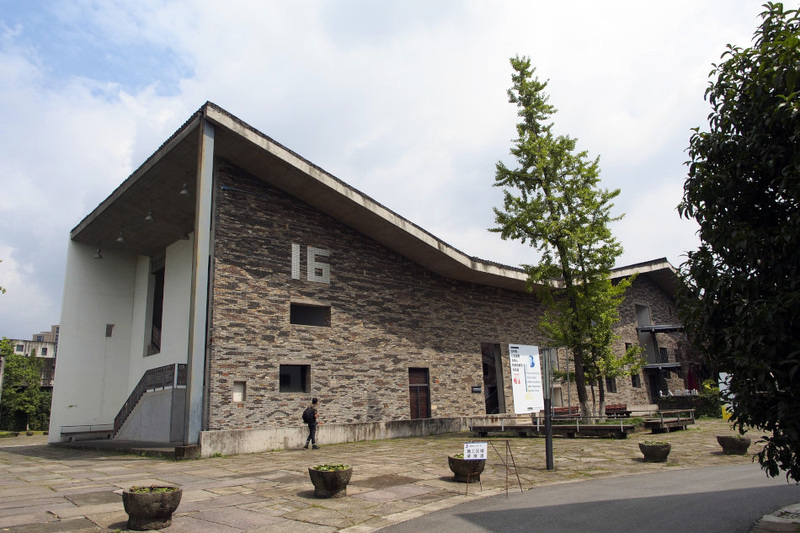 Their most famous works include the Ningbo Museum (2008), and Xiangshan Campus of China Academy of Art near Hangzhou (2007). 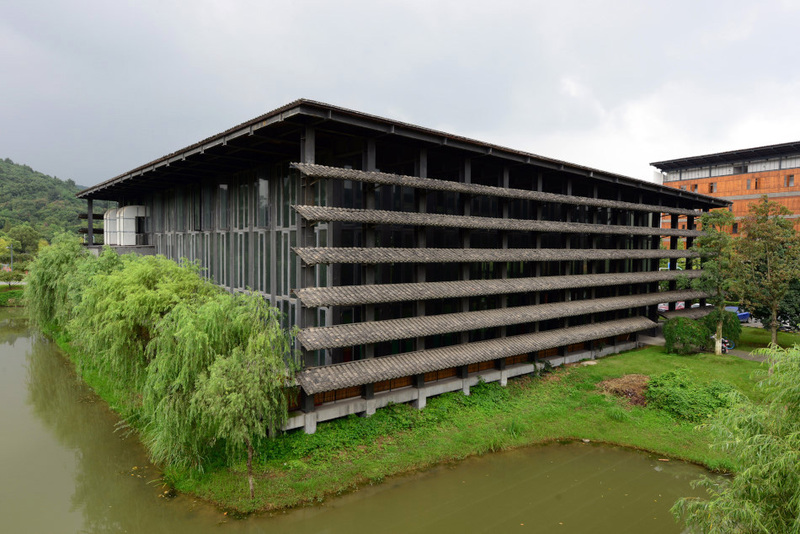 After receiving a number of international awards for their effort on redefining contemporary Chinese architecture, in 2012 Wang Shu was rewarded with the Pritzker Prize, which considered to be the highest award in the international architectural industry. 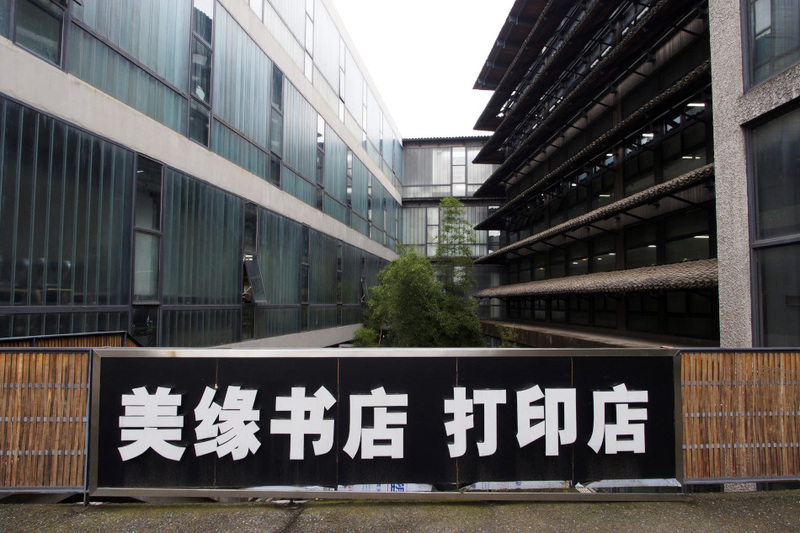 In 1928, China Academy of Art was founded in Hangzhou. 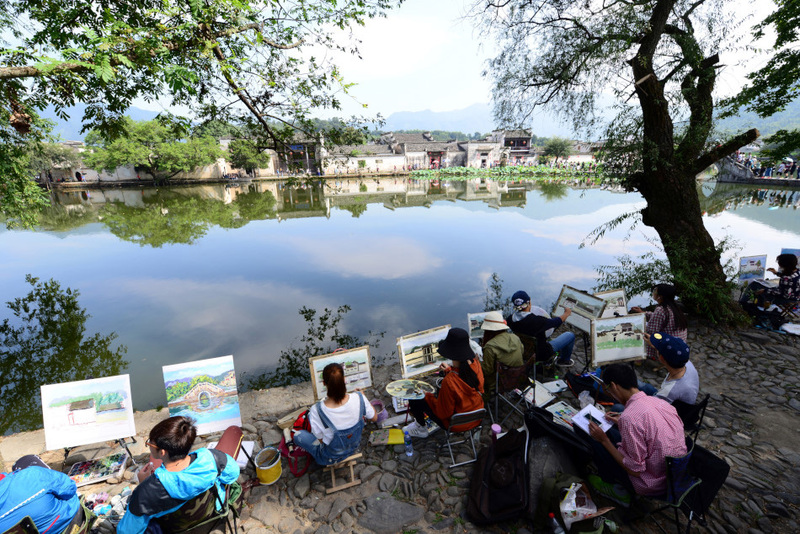 It is the oldest and most famous art school in China. 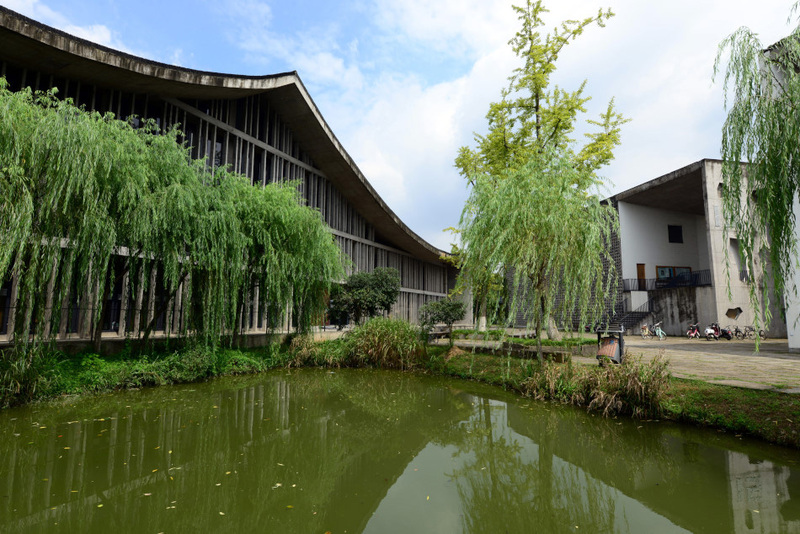 Today the academy has two campuses in Hangzhou, one right by West Lake at city centre, and a newer one in Xiangshan, at the southwest outskirt of the city. Wang Shu and Lu Wenyu began the design of Xiangshan Campus in 2002. Many buildings, including a library, a gallery, 6 school buildings, 2 studio buildings, 2 bridges, etc., were completed in 2004. The campus continued to expand until today, and has undoubtedly become one of the most influential projects of Amateur Architecture Studio. 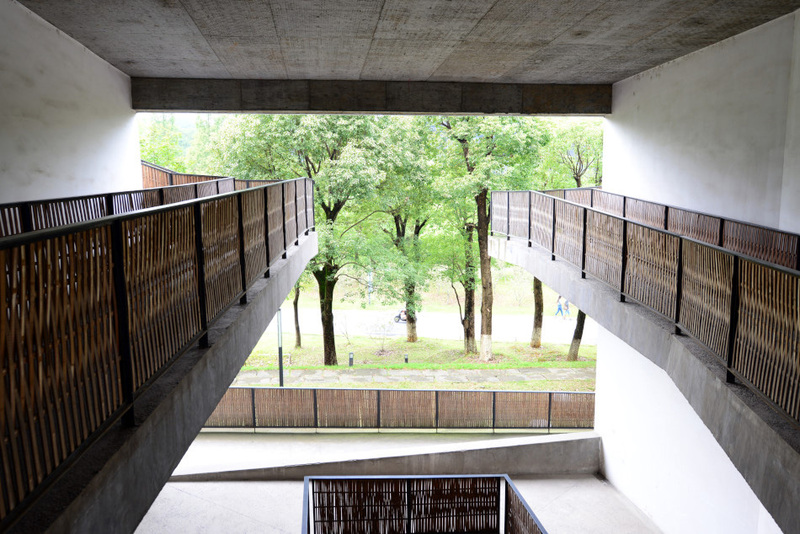 The campus presents a good example of Wang and Lu’s design ideology of capturing the spirit of the place and reinventing the Chinese architectural traditions into contemporary uses. 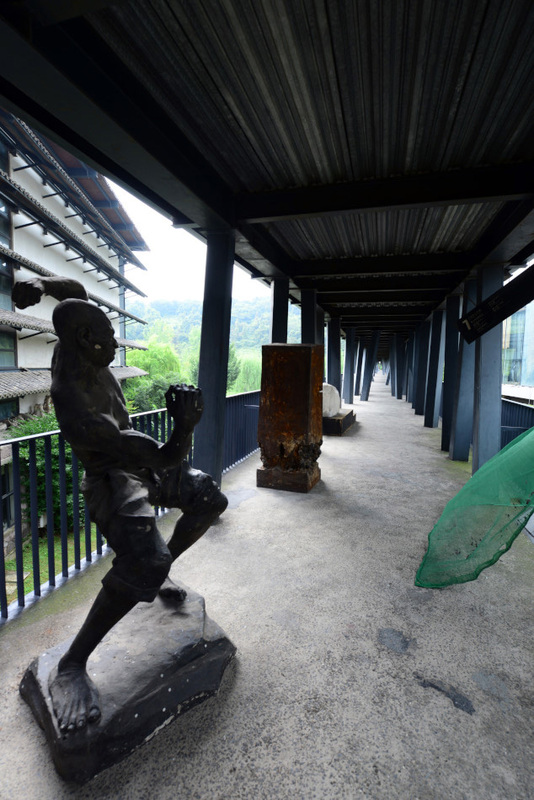 Many buildings at Xiangshan were actually built in traditional construction methods, despite the use of modern materials such as glass and metal. 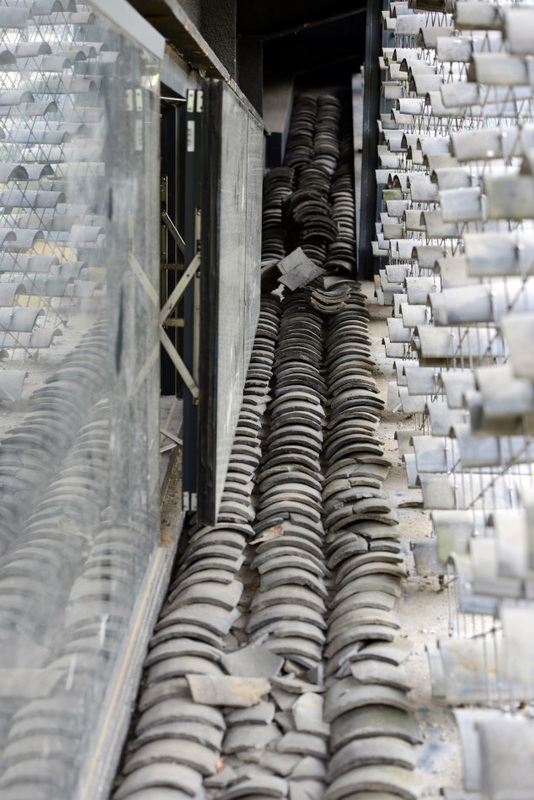 Old roof tiles were salvaged from all over the province of Zhejiang and reused at Xiangshan as shading device and wall cladding. We spent about three hours wandering around the campus, visited about half a dozen of buildings before heading back to the city. Reclaimed material is always a major component in Wang’s and Lu’s projects. 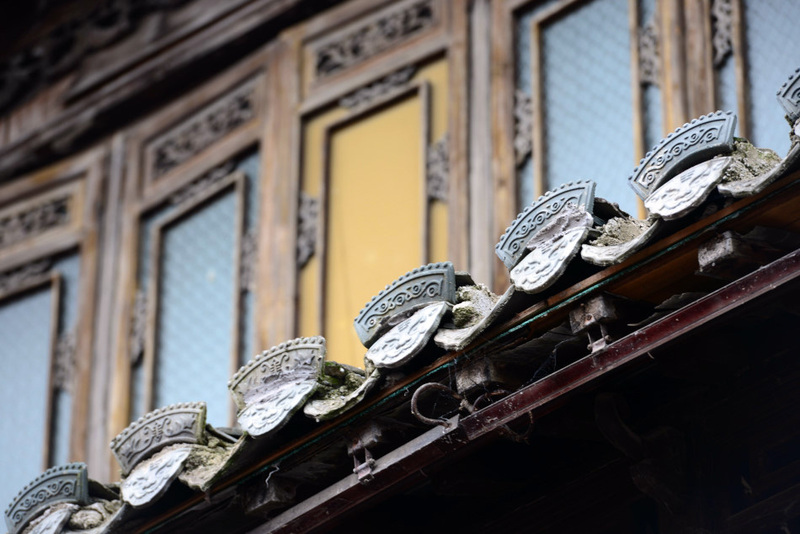 At Xiangshan, reclaimed roof tiles and wood panels can be seen all over. 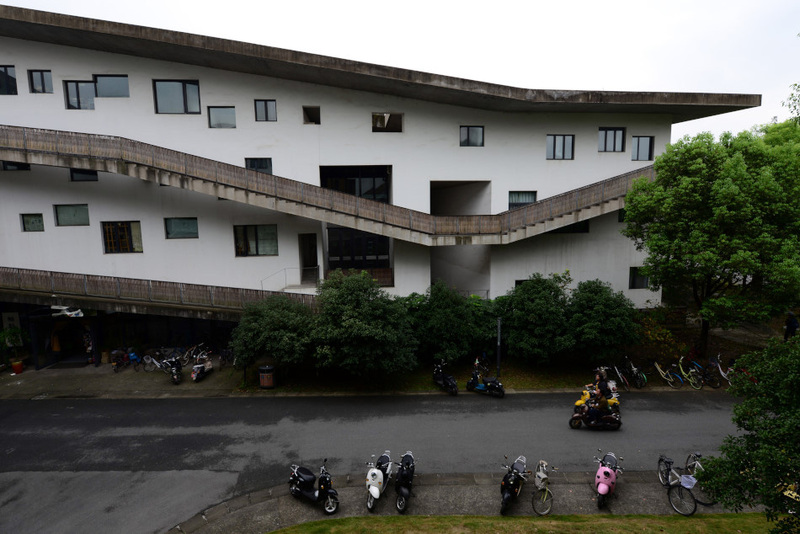 Courtyards, a essential component in traditional Chinese architecture, also have a vital role at Xiangshan as much of student life happen in these enclosed open spaces. 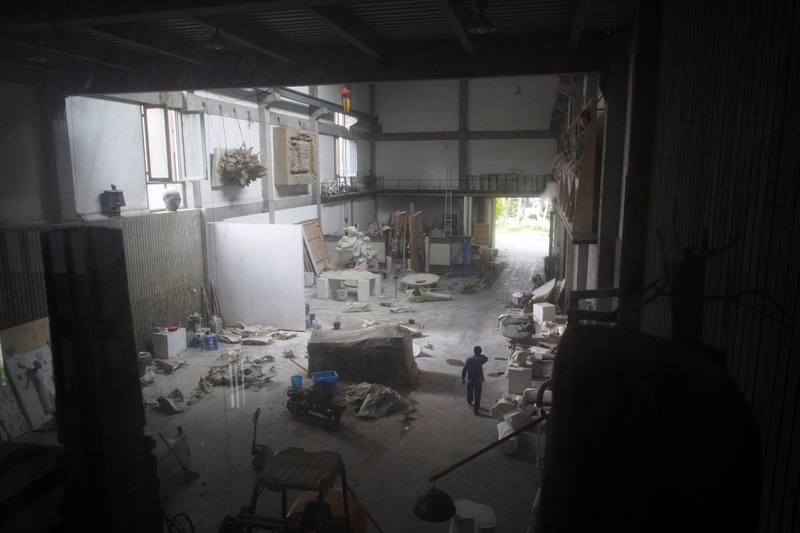 A peek into the sculpture hall. Footbridges connect many buildings in Xiangshan. This is one of the interestingly designed pedestrian bridge that crosses a small canal, and has been temporarily turned into an open air exhibition space for students’ art pieces. 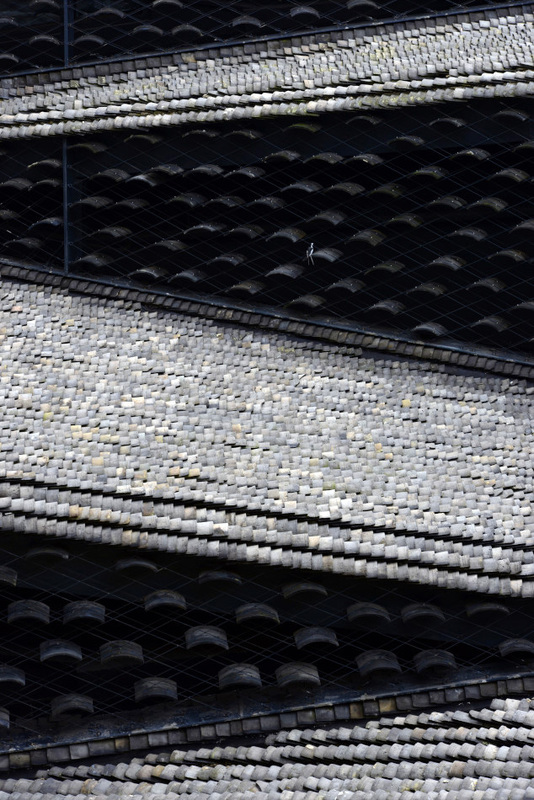 Old roof tiles from all over the province are reused here as horizontal shading device. The library complex is consisted of two buildings with contrasting facade treatment. Ramp is a major design element in the campus. In some cases, the upper levels can be accessible for scooters and bikes. Despite the overall brutal finishes and craftsmanship, Wang’s and Lu’s design concepts have successfully created interesting architecture out of traditional Chinese architecture and Modernist design approaches. In a number of the buildings, exterior circulation has become a main facade feature. Though in some cases, the circulation route would be in conflict with window openings. 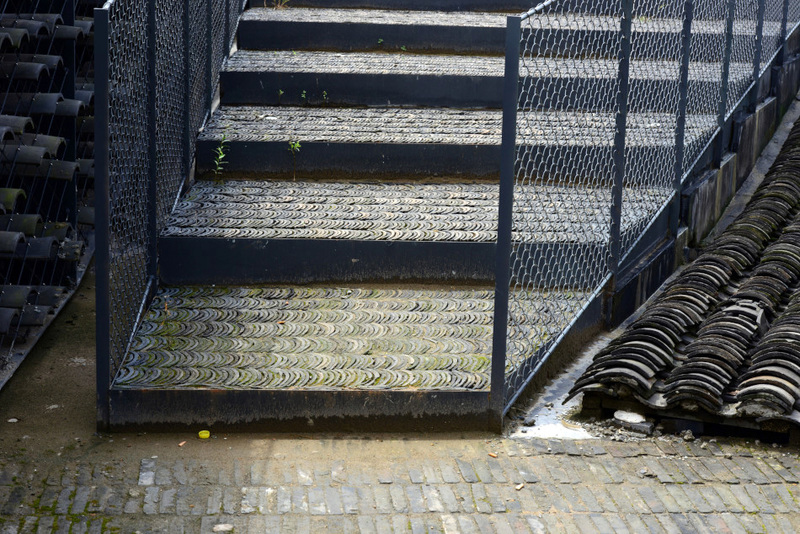 Depending on the slope, some of the exterior circulation route are actually steps. The wood and stone guesthouse and restaurant building is a recent addition to the campus. The interplay of walls cladded with different stones is covered by a large roof. 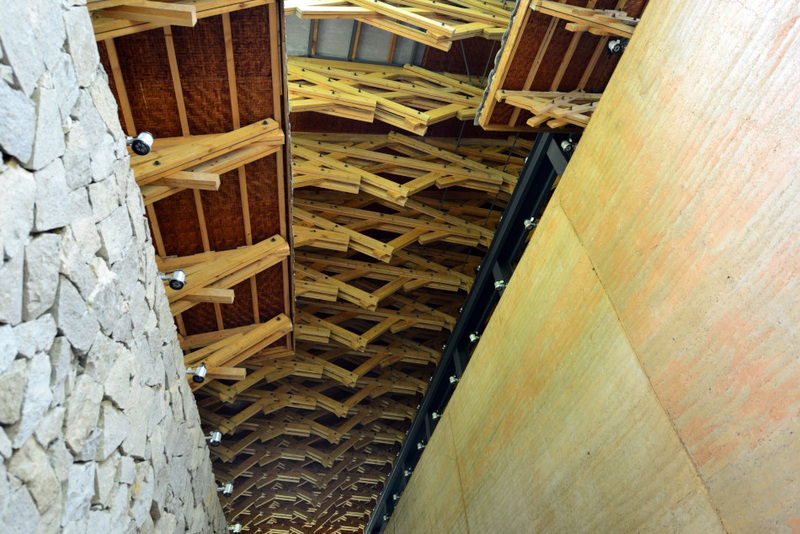 With a natural touch, the underside of the roof is dominated by the heavy use of timber trusses and bamboo mats. There is a water pond in front of the School of Architecture area, encompassing three major buildings with distinct architectural treatments. 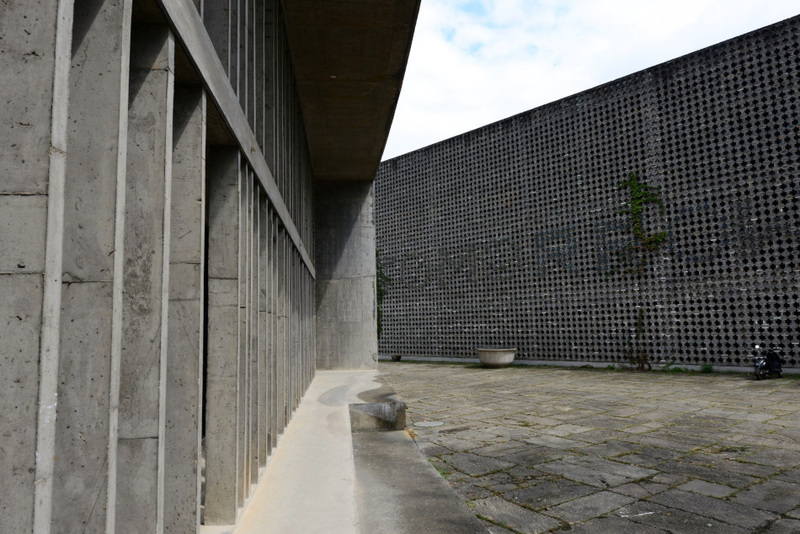 Similar to the Ningbo Museum, reclaimed bricks and tiles are used to clad outer walls. Like traditional Chinese architecture, tranquil courtyards give another dimension to the buildings in Xiangshan, where the boundary between exterior and interior remains loose. 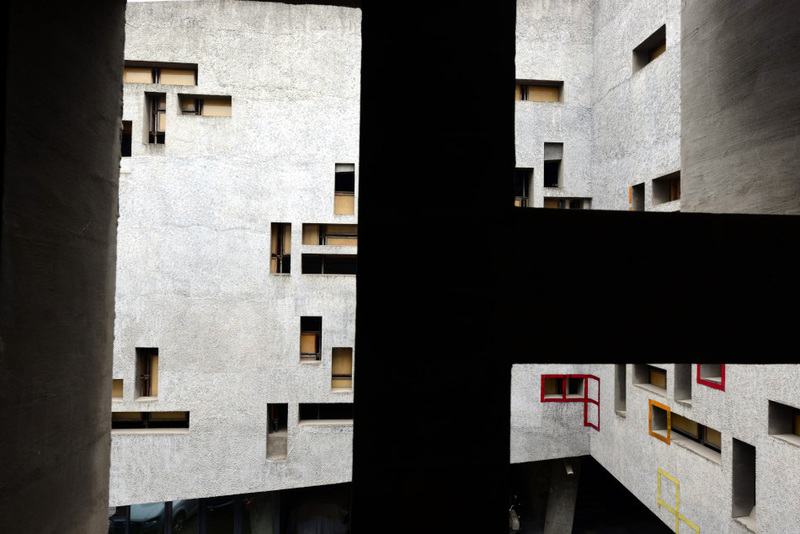 Irregular opening on concrete walls represents another design approach, framing unique views for users in the buildings. Reclaimed wood panels serve well as a backdrop for sculpture display. 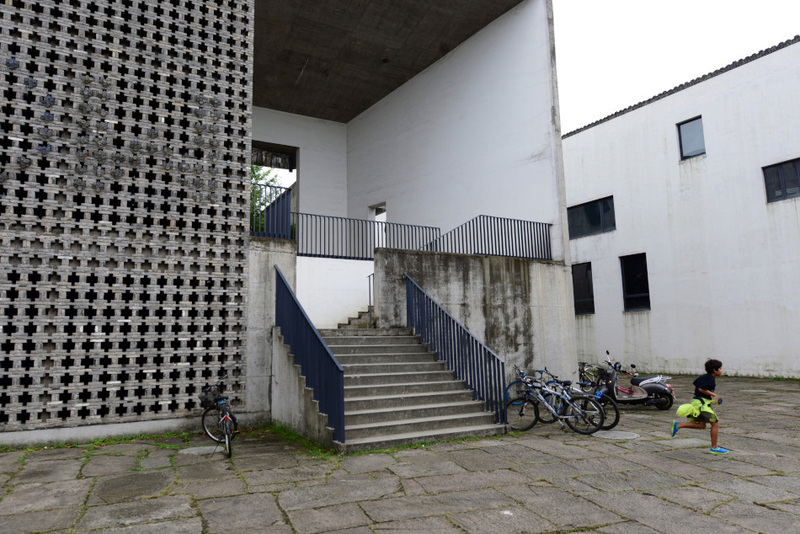 Distinct brise-soleil of the two School of Architecture buildings: concrete vertical fins and masonry cross openings, create a coherent atmosphere for the exterior forecourt where the flanking contrasting textures complement each other. 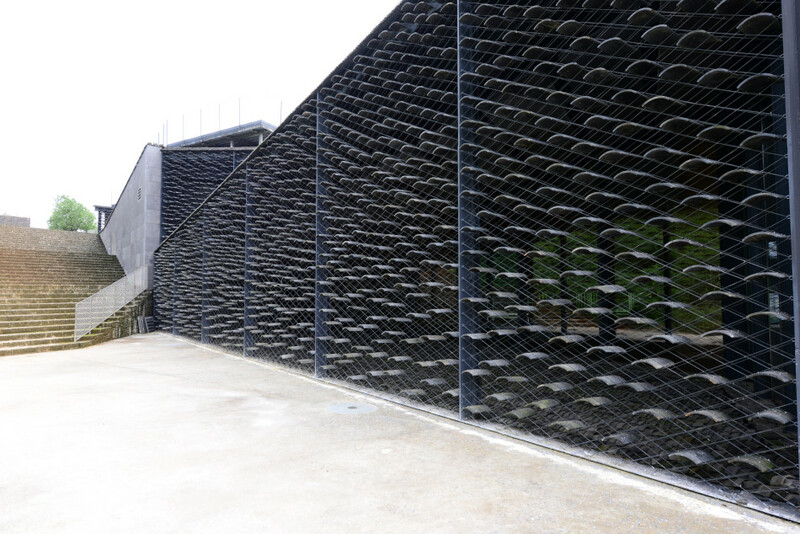 Entrance to one of the School of Architecture building: Bricks are used to form a perforated skin. The word “TOMORROW” is highlighted on the wall surface by filling in the wall openings with glass bottles, like a pin art effect. Getting up at 4am wasn’t the easiest thing to do, but the temptation of watching the sunrise over the sea of clouds of Huangshan was too difficult to resist. Given the wet weather the day before, we weren’t too optimistic about seeing the perfect sunrise. We put on our headlamps and raincoats, carried our cameras and hiking poles, and headed out into the dark. The air was filled with light drizzling and mist. We decided to go ahead despite the unpromising weather. In the dark, we hiked for about half an hour before reaching Shilin Hotel (獅林大酒店), from where a small path would lead up to Lion Peak (獅子峰), our intended spot to watch sunrise. Followed by another small group of tourists, we found our way up the small path, passing by Refreshing Terrace (清涼台), a popular sunrise hotspot that was already filled with people. We walked further up hoping to reach Lion Peak, but soon found out that the path to Lion Peak was fenced off. We had no choice but switched to another lookout nearby called the “Monkey Watching the Sea” (猴子觀海). There were half a dozen or so people at the lookout when we arrived. We shared a rock with a woman from Shandong. We chatted a bit as more people cramped onto the lookout. The cloud was thick and the fog never went away. 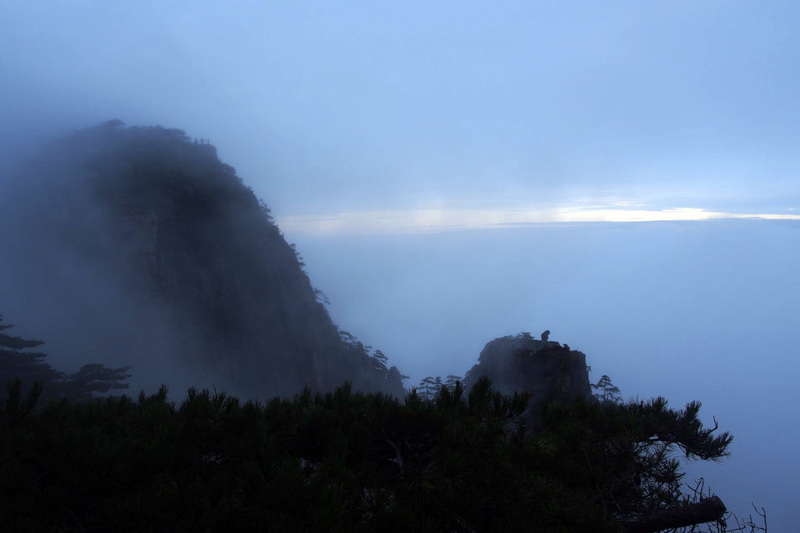 From 5:45am to 6:15am there were a few moments when the fog subsided a little, exposing the silhouette of the rocky peaks of Huangshan’s Beihai (北海) area. Adjacent to the lookout we could see a small rock standing on a flat mountaintop that resembled a monkey in sitting position. This scene is known as “Monkey Watching the Sea” (猴子觀海). No rising sun from the horizon nor vivid skies, our Huangshan sunrise experience was limited to a few moments of mountains emerging from heavy fog. We left the lookout and returned to our hotel for breakfast. After checking out, we began our hike over to the south side of the summit area, where a number of the popular attractions gathered. 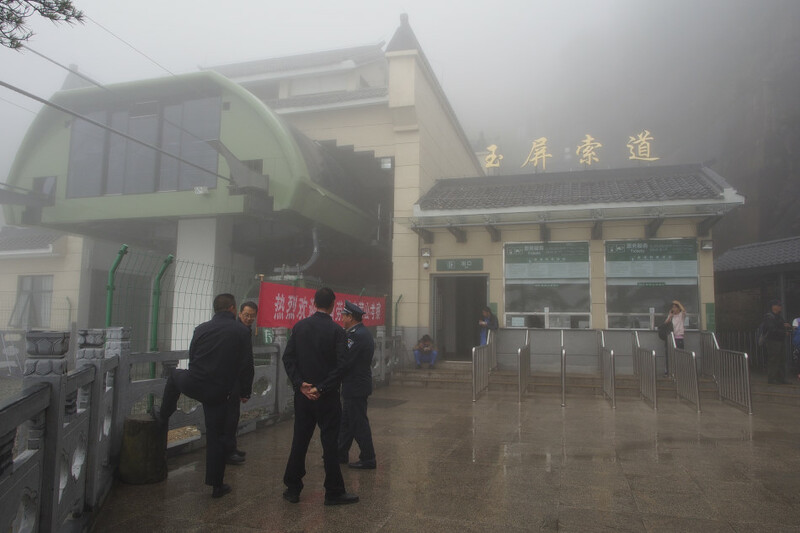 In the fog, we slowly found our way to Yuping or Jade Screen (玉屏) Cable Car Station for our ultimate descend. We first hiked up to Bright Summit Peak (光明頂). At 1,840m, Bright Summit Peak is one of the highest points in Huangshan, and it also serves as a circulation hub where a few paths converge. Everything was completely covered in fog when we reached Bright Summit Peak. We didn’t stay long as the top was really noisy and crowded. We followed the sign pointing to Jade Screen Scenic Area. First we reached Turtle Peak (鳌鱼峰). We stopped atop the “turtle shell” for a few minutes, though all we could see around us was white fog. We continued our journey and next we reached “Ladder on the Clouds” (百步雲梯), a steep rock stair that led us up to another high point. This side of the summit area was way more crowded with local tourists than the West Sea Canyon we visited the day before. Again because of the fog, we didn’t stop for long. Our next stop was Lotus Stamen Peak (蓮蕊峰), from where a steep stair could be seen leading to the famous Lotus Peak (蓮花峰). It was unfortunately closed as well. Continuing our journey, we finally reached Yuping Scenic Area where the granite mountains were renounced for their resemblance a Chinese screen made of granite stones. Before we went for Yuping cable car we decided to check out the famous “Welcome Pine” (迎客松). 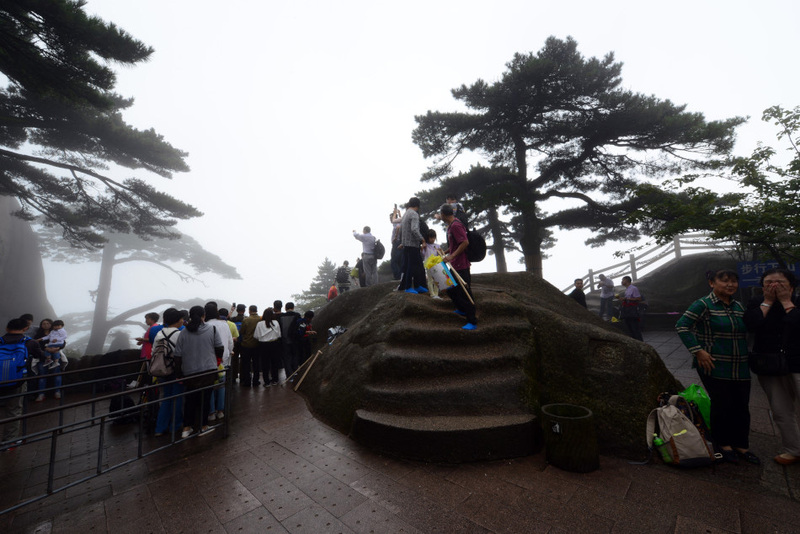 Renowned as the welcoming feature for all travelers since ancient times, the “Welcome Pine” has long been the star of Huangshan. Unfortunately, due to its fame came its misery. All local visitors love to get close to the tree for a photo. Sometimes, they may get a little too close and actually damaged the tree and its roots. Nowadays, the fragile “Welcome Pine” is fenced off and artificially reinforced. 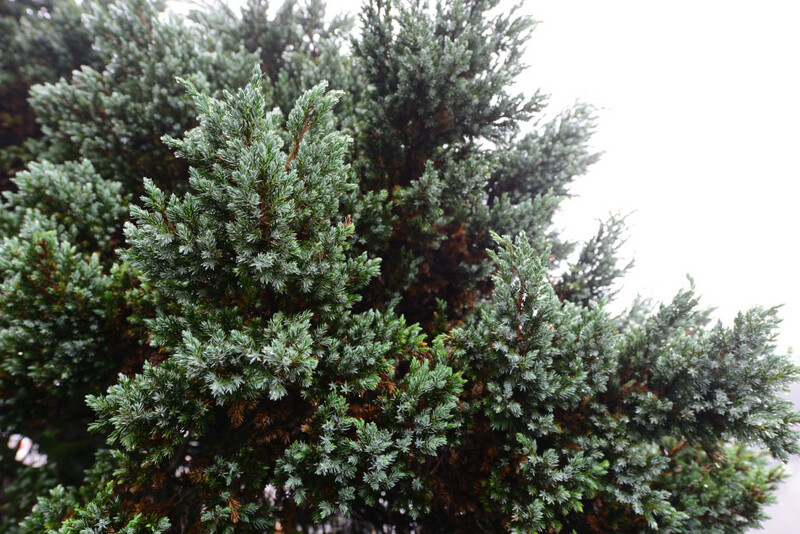 At least it is more fortunate than the nearby Farewell Pine (送客松), which died a while ago. After “Welcome Pine” and a brief stay at the Yuping area, we felt it was time for our descend, as we were hoping to catch a bus from Tangkou to Hangzhou, where we would stay the last night of our trip. 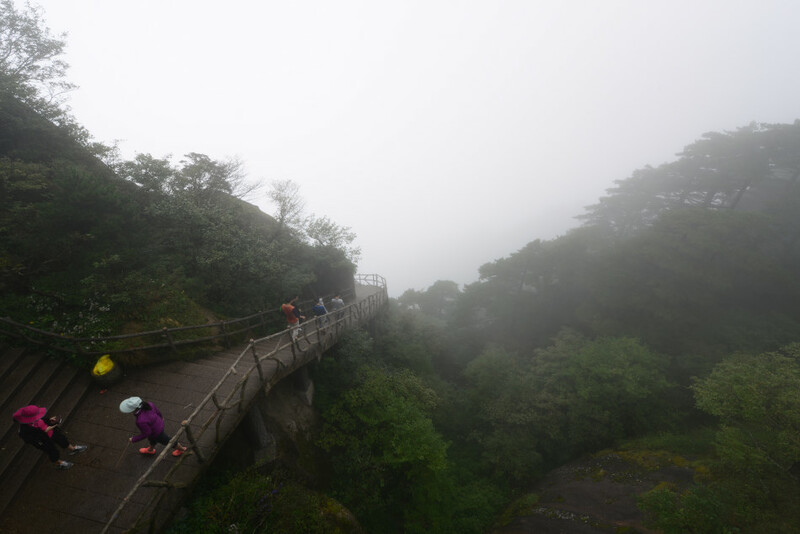 It was awfully foggy and wet during our stay at the summit area of Huangshan, but we had a good taste of its spectacular granite formations, and a few magical moments of poetic scenery. 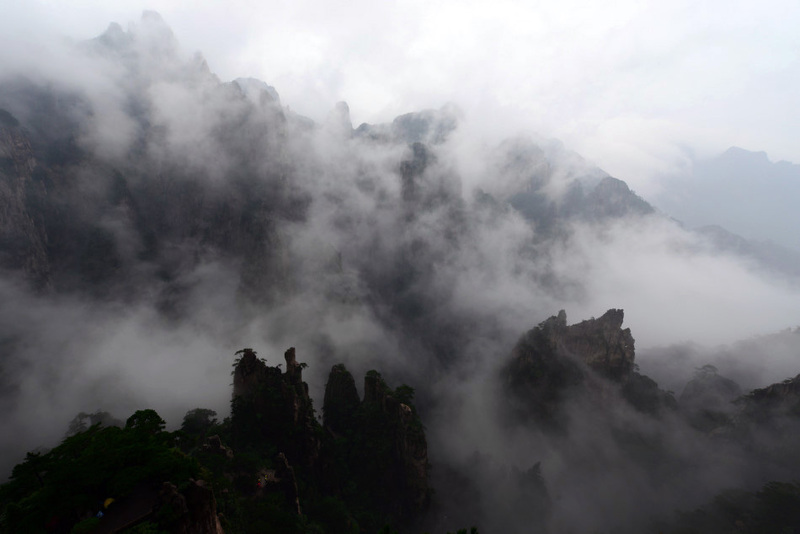 The first magical moment when the fog subsided, exposing the silhouette of the rocky peaks of Huangshan’s Beihai (北海). From the lookout, we could see the rock formation “Monkey Watching the Sea” (猴子觀海). The sun was slowing rising above the horizon in behind. This was the clearest moment we had during our wait for the sunrise. Layering of pine trees in thick fog. 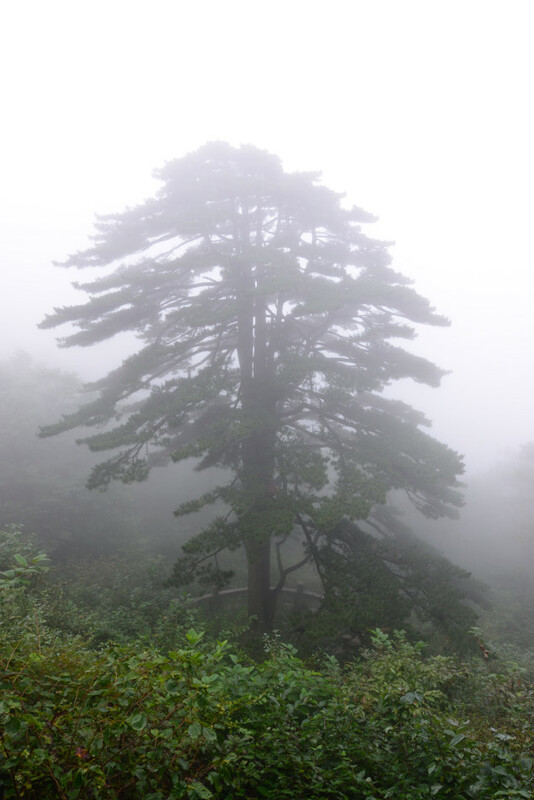 Pinus hwangshanensis, or Huangshan Pine, is indeed an endemic species found only in Eastern China. Although we could not see the perfect sunrise but we found ourselves lucky to have a few glimpses of the granite peaks in the sea of cloud in such bad weather. After watching the sunrise, we enjoyed the quiet morning walk back to our hotel for breakfast. The Couple Pine (連理松) is a unique attraction especially for couples. Most of the pine trees that we saw were oddly shaped with a few long branches stretching out but the Couple Pine is actually consisted of two tall trees with similar height and branch arrangement. It was sometime difficult to distinguish which rock formation was natural and which was man-made. Some natural rock formations were too perfect that it had an artificial feel to it. This was indeed the “head” of the Turtle Peak (鳌鱼峰). This stretch of the trail was the most frustrating because of the crowd and the noise. This trail links a number of famous spots of the Yuping area, and inevitably it is very popular among day trippers and tourist groups. There were moments of sun-break. When the sun was out, it was scorching hot with the humidity. 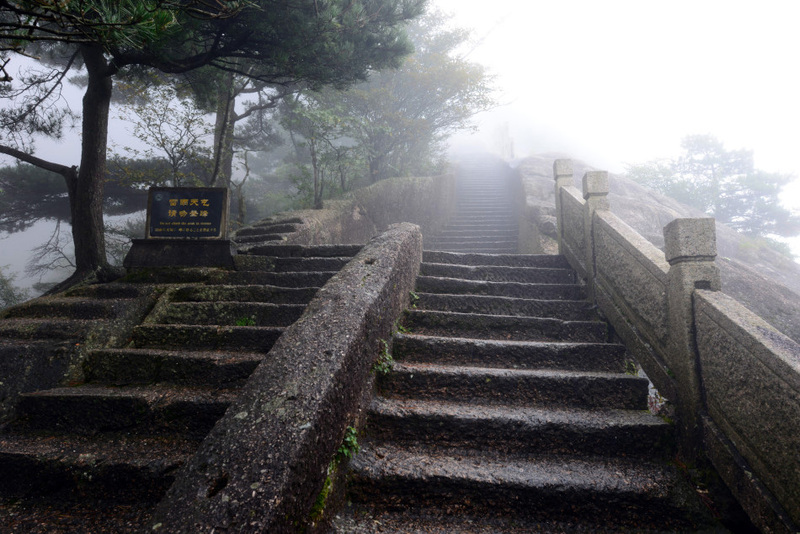 The stone steps are leading up to the Lotus Peak (蓮花峰), the tallest peak at Huangshan. On the day of our visit, it was closed to visitors for maintenance. Many said that Lotus Peak and Heavenly Capital Peak (天都峰) open to visitors alternatively. The further down we got, the thicker was the fog. Visibility was low and everything was veiled with a greyish tone. This path is leading down to the foot of the mountain from the Welcome Pine (迎客松) area. Since we had to catch the long distance bus to Huangzhou, we decided to take the cable car. The famous Welcome Pine (迎客松) – in the far background on the left – is a magnet to the local tourists. Because of its popularity, this ancient pine tree has been heavily visited and is starting to show signs of decay. Today, special rule is in place to keep tourist crowd away from the pine tree. A closeup of the pine needles. 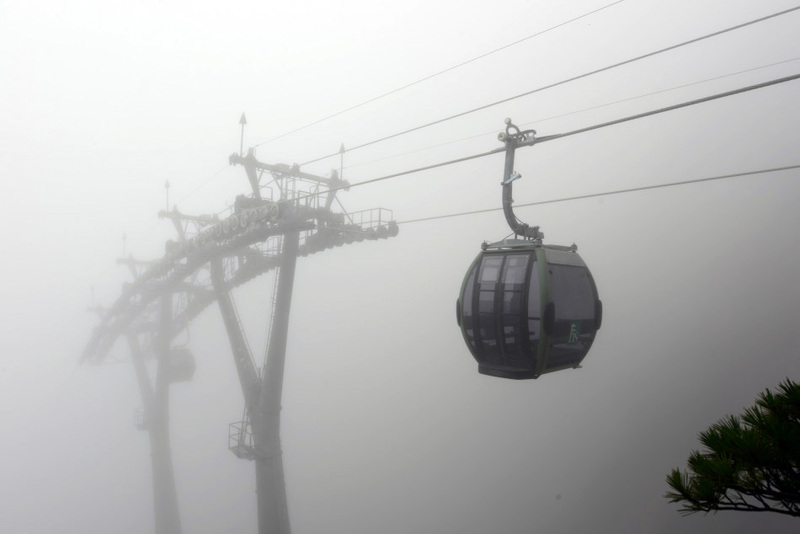 Standing on the small terrace in front of the cable car station, we fixed our gaze on the moving Yuping cable car disappearing in the mist one after another. We found the scene very romantic. 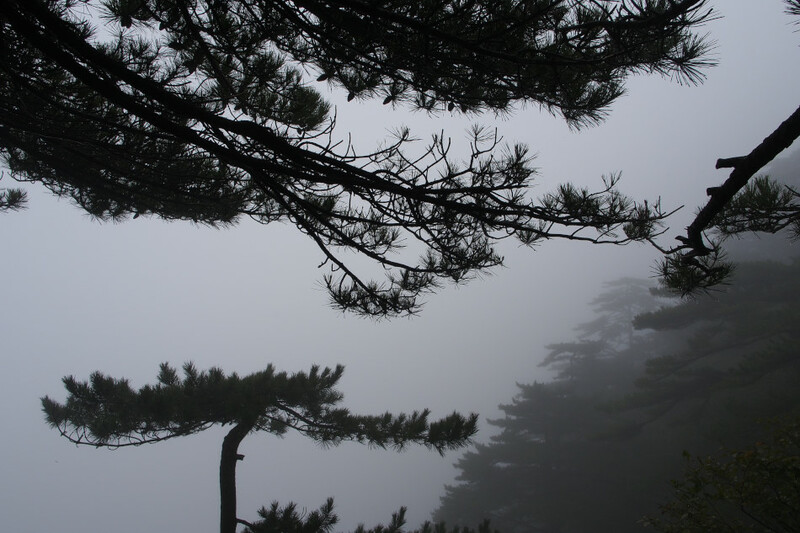 In bright sunny day, we could see better and further but the foggy weather gave a mysterious atmosphere to our Huangshan visit. Ticket office at the Yuping cable car station on the summit. The design of the station is hardly a complement to the contemporary design of the cable car. The cable car ride down to the mountain was quite comfortable. It wasn’t the most crowded time of the day and we were delighted to have our own car. The cable car was designed by Austrian Doppelmayr Seilbahnen GmbH, a leading cable car manufacturer. 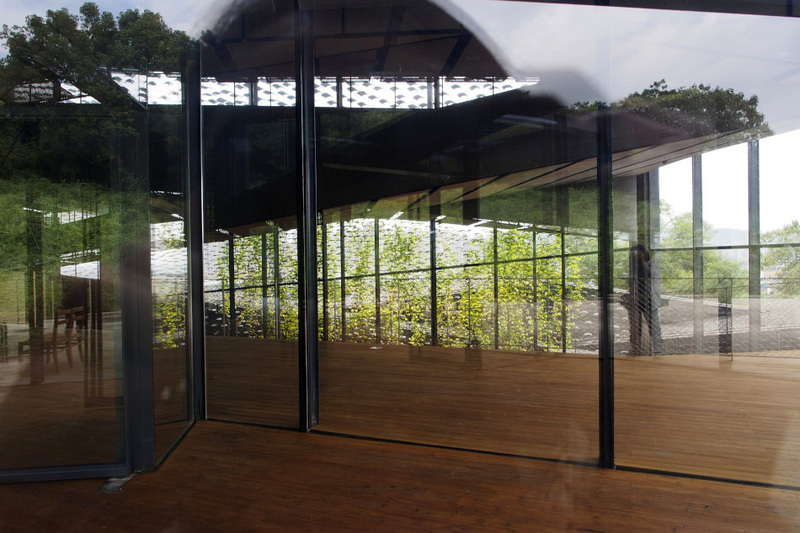 The design gave visitors a panoramic view of the natural scenery. Peculiar granite peaks, ancient pine trees, and the majestic sea of clouds, Huangshan (黄山) is considered by many as the most picturesque mountain range in China. 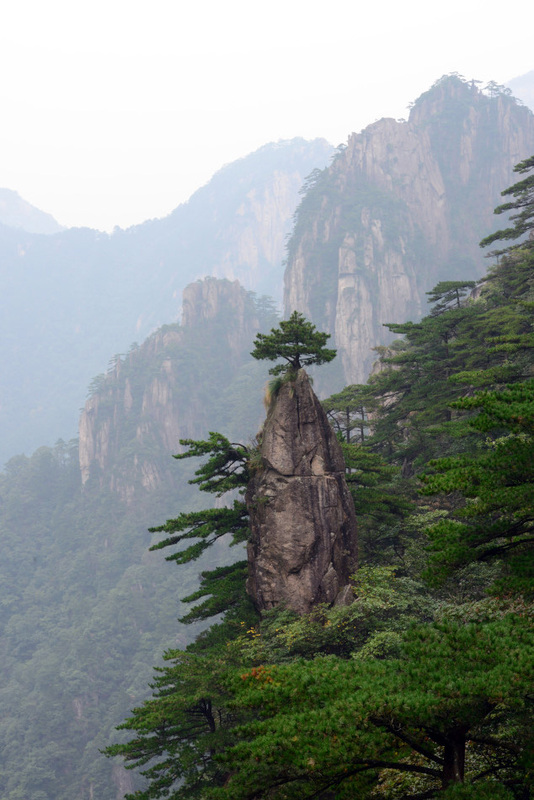 Throughout history, the scenery of Huangshan has long been a popular subject for Chinese literature and paintings. 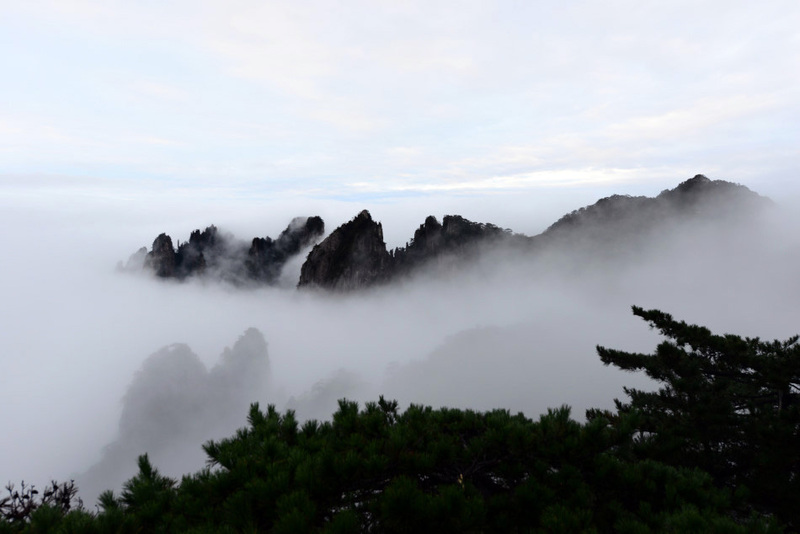 What so special about Huangshan is its frequent foggy days during which the entire summit area is concealed behind moving mist, revealing only small fragments of its rocky silhouette at certain moments. 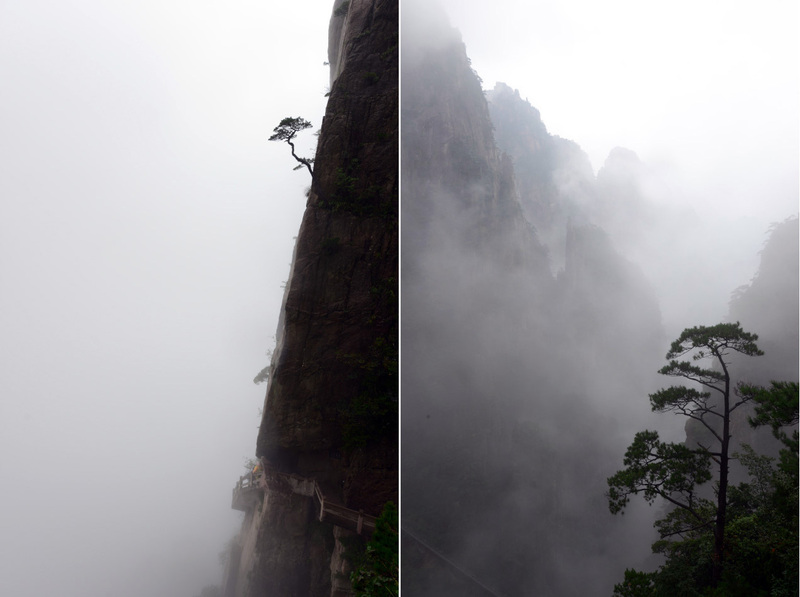 This mysterious scenery has become a major inspiration for the pursuit of yi jing (意境). Yi jing refers to a way to see beauty through poetic revelation. The pursuit of yi jing is common in Chinese artwork and poetry. Artists or poets often find ways to express yi jing in their work through abstract depiction or selectively not showing something in order to convey the hidden beauty of the whole picture. 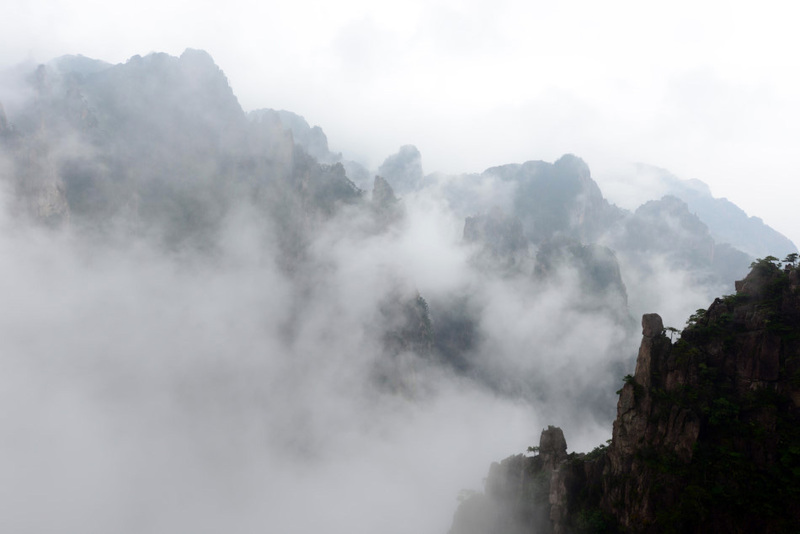 To put it in other words, yi jing is about conveying the essence of something without depicting it fully, just like the scenery of Huangshan, whose real beauty is often hidden from view. 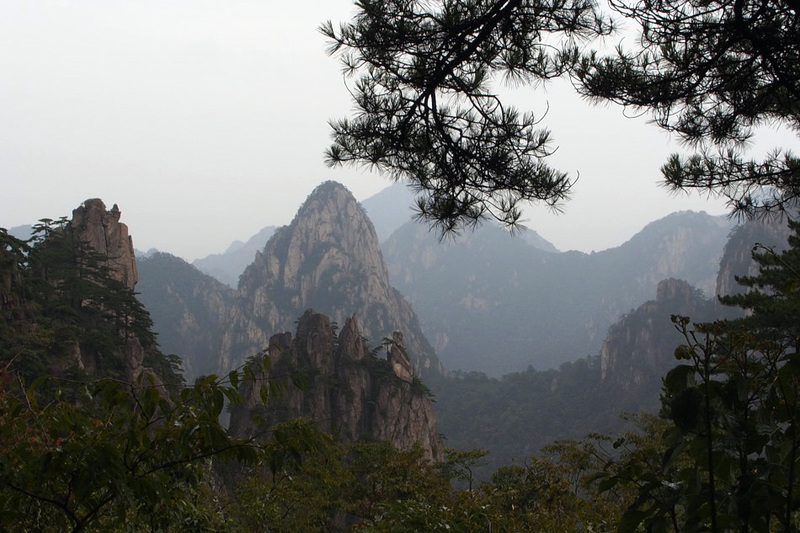 At 1,864m, Lotus Peak (蓮花峰) is already the tallest peak in Huangshan. 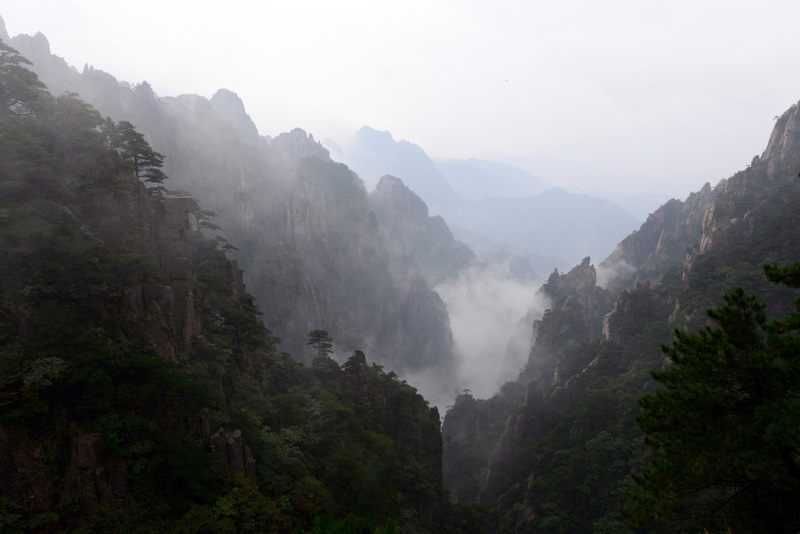 While the height of 1,864m is hardly the tallest mountain in China, the granite peaks shaded first by an ancient sea and then retreating glaciers had inspired ancient poets and painters and modern photographers and movie directors (James Cameron cited Huangshan as a major inspiration for 2009’s Avatar). 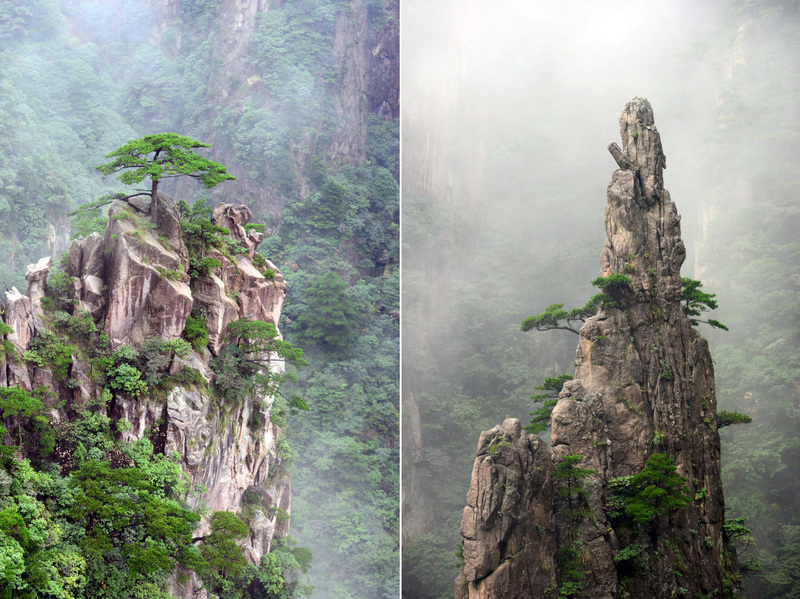 With its unique scenery and endemic pine trees, in 1990 Huangshan was enlisted on UNESCO’s World Heritage list. 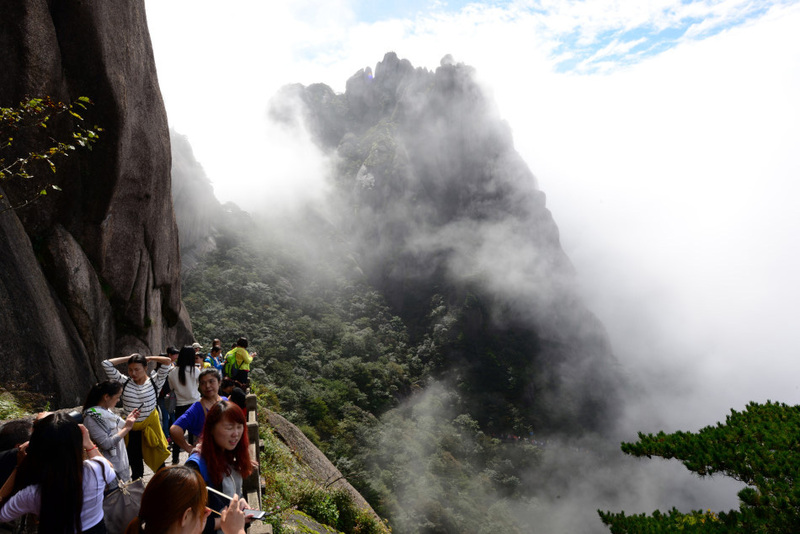 Today Huangshan is a top tourist destination in China. At the summit area there are several hotels and guesthouses, cable car services at four different locations, and extensive paved trails crisscrossing the famous peaks and scenic lookouts, capturing the imagination and hearts of visitors from dynastic era to the contemporary. At around 6am, we left the youth hostel at Tunxi’s Laojie and hopped on a tourist bus heading to Tangkou (湯口), the base town at the south entrance of Huangshan’s scenic area. The bus journey took about 1.5 hour. At Tangkou, we got to transfer onto a shuttle bus designated for a specific cable car station; but beforehand, we had to decide which path to take. 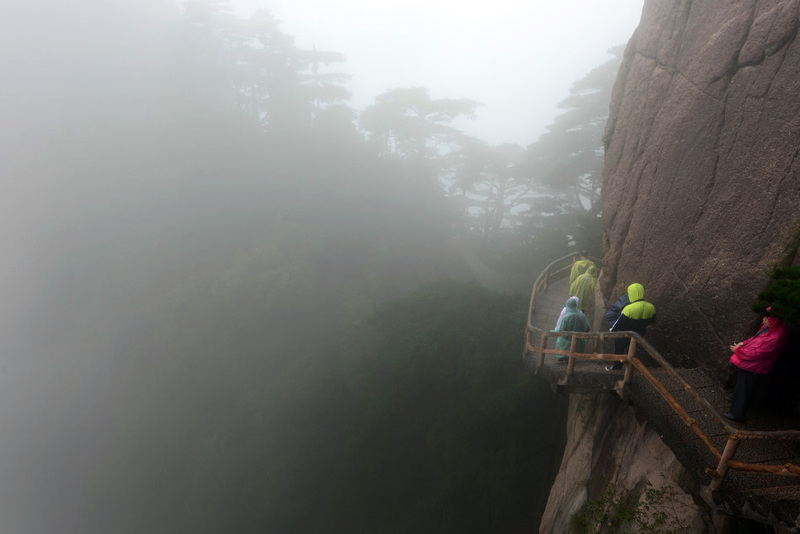 There were a few options to climb to the summit area of Huangshan, either by cable car or by half-day hike. Since we preferred to spend more time at the summit so we decided to take the cable car. There are two cable car stations accessible by shuttle bus from Tangkou, the Yungu (雲谷) and the Yuping (玉屏). 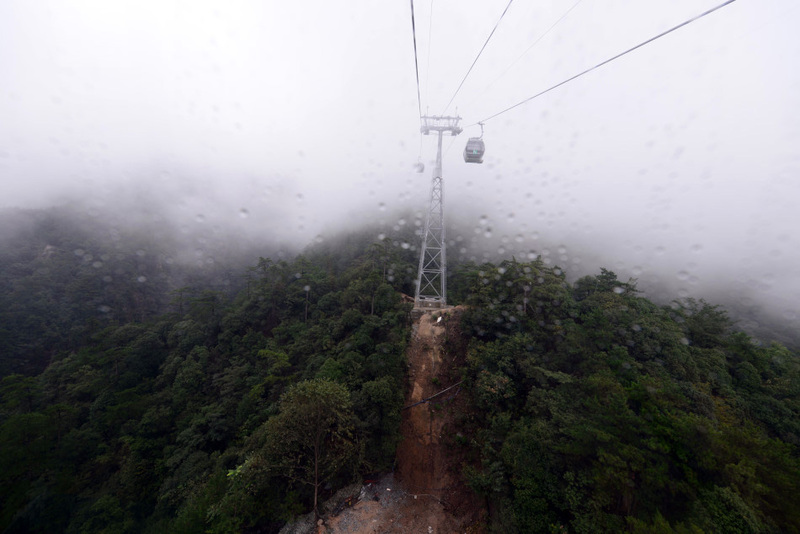 We picked the Yungu cable car for its close proximity to our hotel Xihai Hotel (西海飯店) at the summit area. The cable car journey only took about ten minutes. It was drizzling when we arrived the submit area. In light rain, we found our way to the hotel in light rain, checked in, dropped off our bags, and headed out again to the trail head of West Sea Canyon. 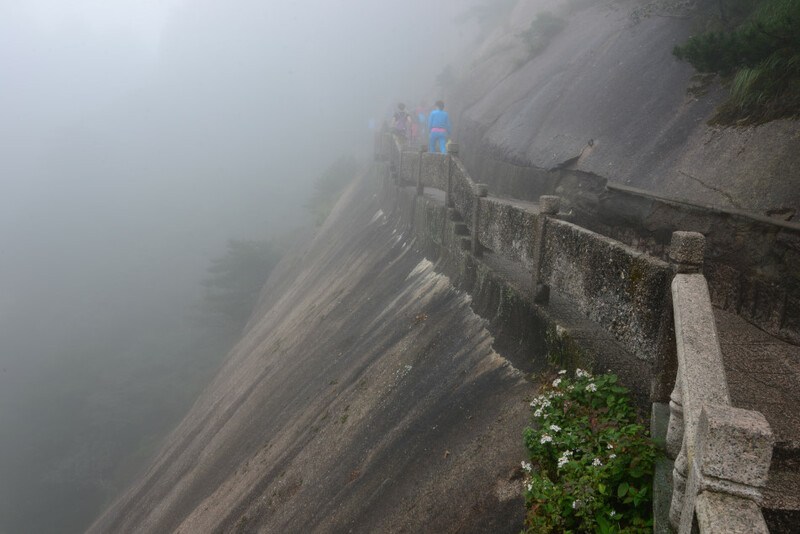 The summit area of Huangshan host a series of hiking trails. The area is large enough to keep any visitor busy for at least two days. 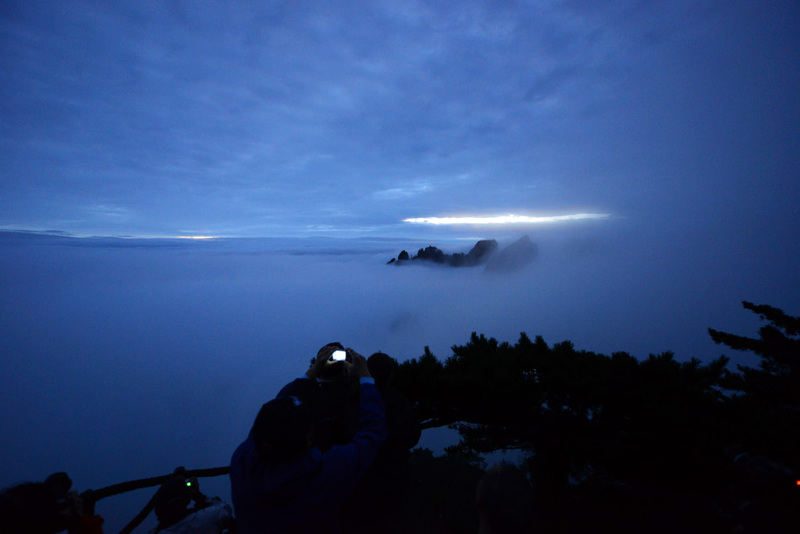 Given the unpredictable weather of Huangshan (over 200 rainy days per year), staying a night on the summit area of Huangshan is the minimum. Most local visitors and tour groups favour the Yuping scenic area, where the Welcome Pine (迎客松), Heavenly Capital Peak (天都峰) and Lotus Flower Peak (莲花峰) are located. We opted for the less crowded West Sea Canyon (西海大峡谷), where a narrow cliff-side footpath zigzagging its way down the steep canyon. Despite the rain, the cliff-side footpath down the canyon was manageable. 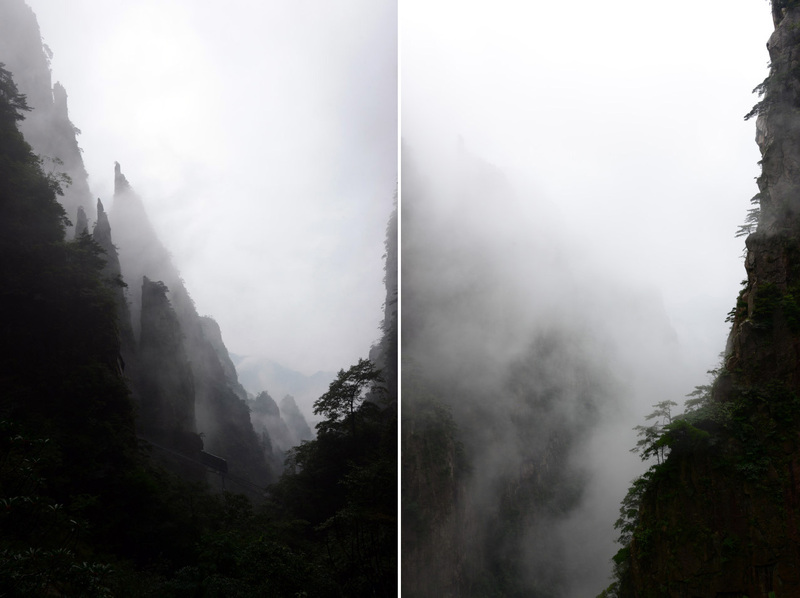 Just as we started our descend, the mist suddenly came and concealed much of the mountain scenery. The famous mist and sea of clouds prevailed. Occasional moments when the granite peaks emerged from the clearing mist were purely magical. We took our time finding our way surefootedly down the steep steps until we reached a pavilion at the canyon’s bottom. 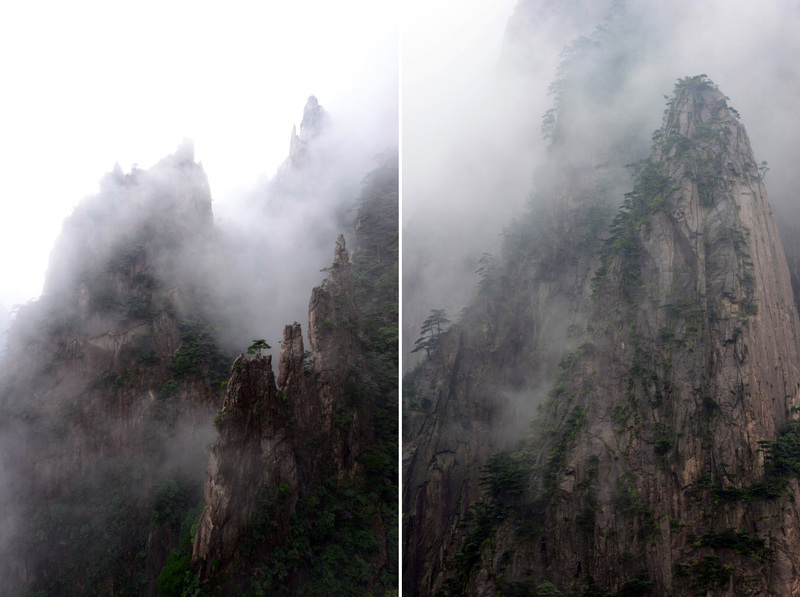 We stopped several times along the way watching the moving mist and photographing the picturesque Huangshan scenery as if meandering through a mysterious Chinese painting. At the bottom of West Sea Canyon, we took the new West Sea Canyon Funicular back up to the summit area. The rain got heavier and the visibility got worsen by the time we returned to the submit. We hiked across the west side of the summit area, passed by the Flying Rock (飛來石) and Bright Summit Peak (光明頂) before returning to the Xihai Hotel. It was rainy and foggy all the way. By the time we arrived at the hotel, we were soaking wet. At the hotel entrance deck, we could hardly see beyond a few meters in the fog. Our first glimpse of West Sea’s scenery as we were heading to the trail head of West Sea Canyon from the Xihai Hotel. Expression of love is universal. 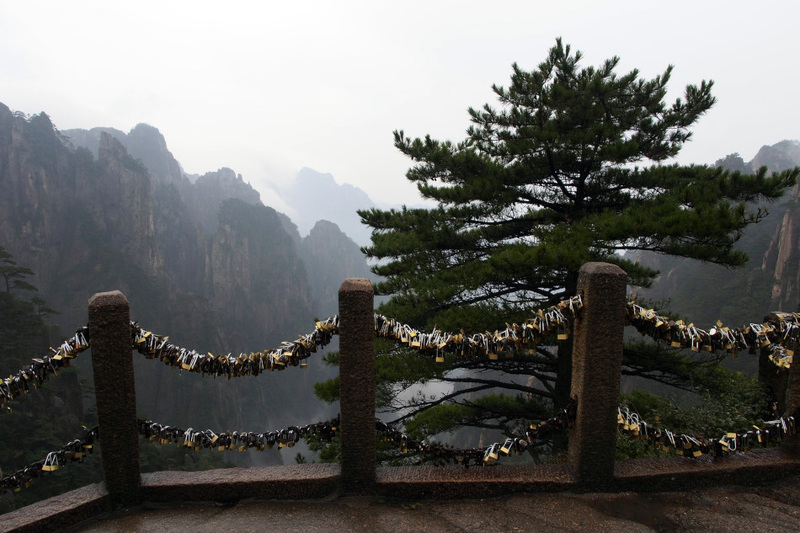 Huangshan is also a popular place for lovers leaving their love padlocks onto the fences as a manifesto of love. Mountain scenery varies in different seasons, weather and time of day. 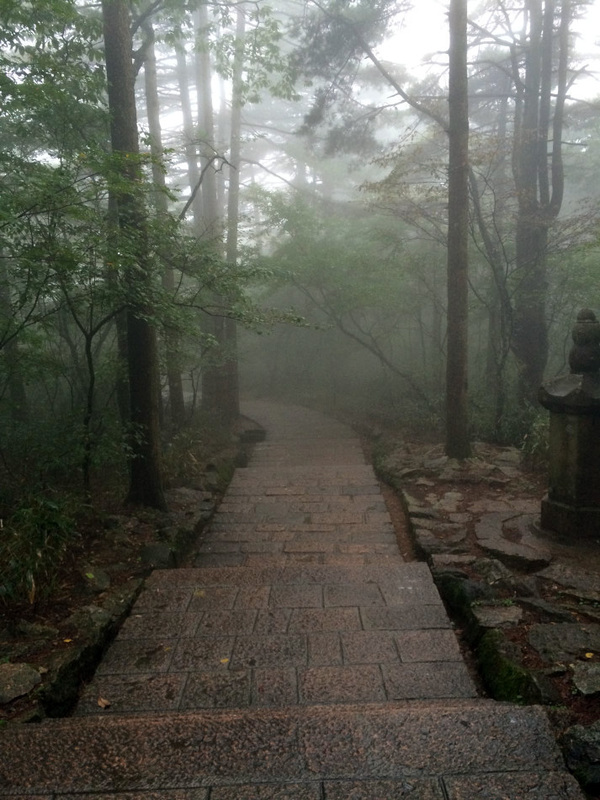 At Huangshan, it was all about the mysterious scenery in the mist. 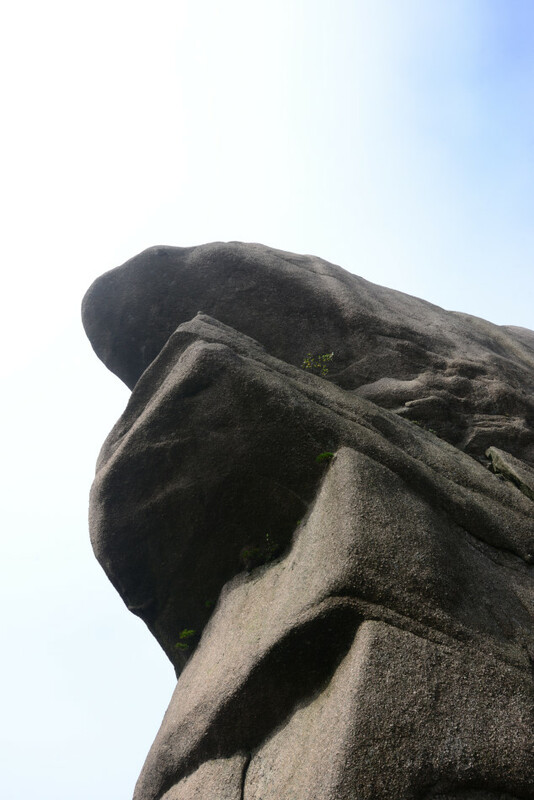 The Chinese named this granite formation, “the Flower Blooming on a Brush Tip” (夢筆生花). It is one of the most popular views at the North Sea area. Looking down to the West Sea Canyon, the mist was gathering at the valley. We were amazed by the engineering of the extensive cliff-side footpath with stone steps held by horizontal supports attached to the rock cliffs of the mountain. Mysterious mountain view of the West Sea Canyon. Visibility was low and everyone was paying extra attention on the trail. The sea of clouds at the West Sea Canyon. The pine trees and the winding footpath attached to the sheer cliff. This picture was taking when we paused and took a break at the mid level of the West Sea Canyon. We were enchanted by the changing mist in front of us. We patiently waited for the magical moments when the granite mountain emerged from the mist for a few seconds. 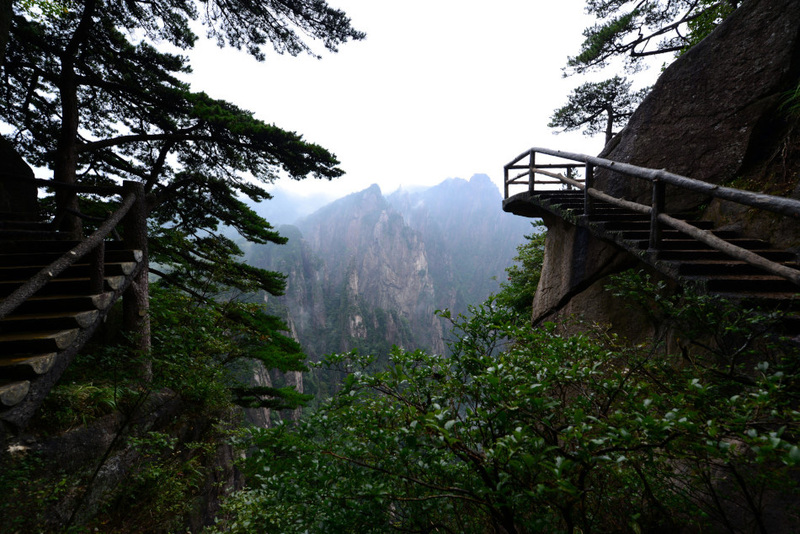 Embraced by the mighty peaks of Huangshan, we cherished the moments when we were alone on the trail. We marveled at the pine trees growing from tiny cracks in the rocks. Before we often saw pine trees being depicted in strange gestures in Chinese paintings. Now we finally saw the real thing and realized where their inspiration originated. 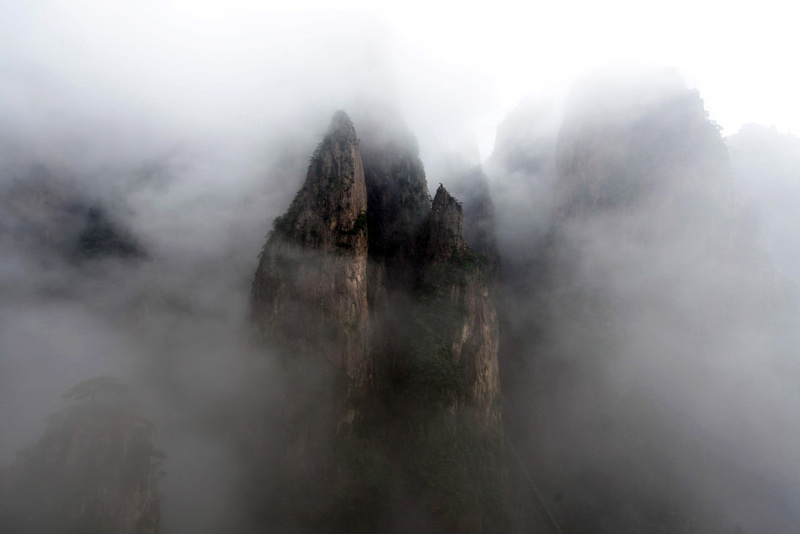 Changing scenery of the mist-encased granite mountains. Approaching the bottom of the West Sea Canyon. Before the West Sea Valley funicular came in service in 2013, the West Sea Canyon trail was like a secret paradise for individual travelers who wanted to seek moment of tranquility away from the horrendous crowds in the summit area. 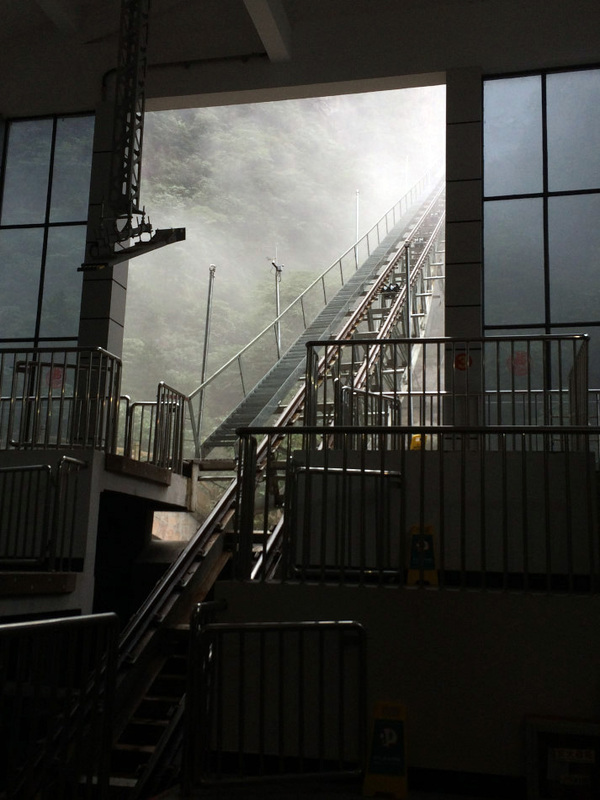 We had mixed feelings for the new funicular. We cheered for its convenience (without doing the return climb via a treacherous cliff-side path and thus saving 2.5 hours of time) but we feared that the West Sea Canyon would eventually lose its serenity. During our visit, we opted for the funicular to save us from the knee and thigh-killing return climb. After Hongcun, we returned to Yixian by public bus. It was mid-afternoon by the time we arrived at Yixian. At Yixian’s bus station, we decided to switch bus to visit another UNESCO World Heritage Huizhou village, Xidi. 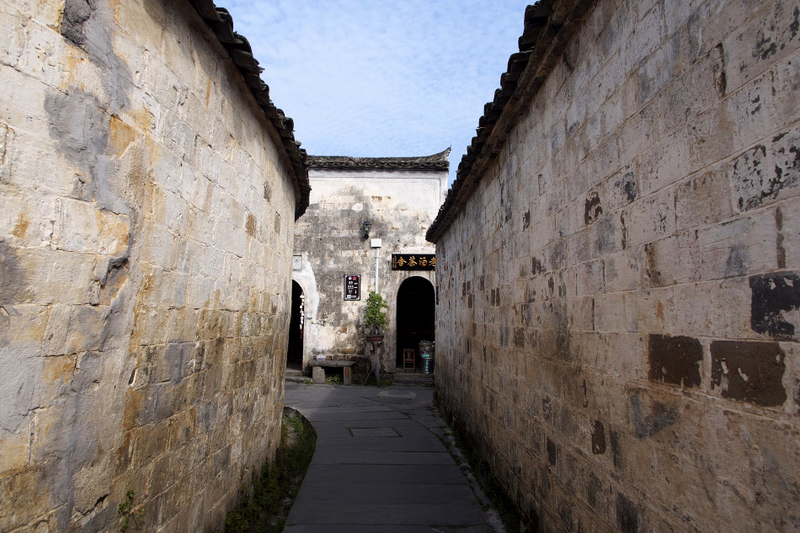 Similar to Hongcun, Xidi has a good amount of ancient architecture dated mainly from the Ming and Qing Dynasties. Dated as far back as the Northern Song Dynasty in the 11th century, Xidi had been inhabited for almost a millennia. 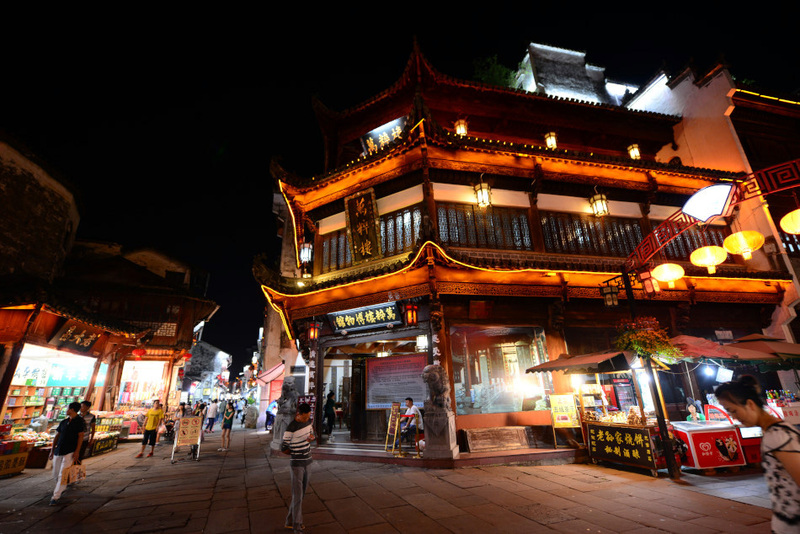 Like Hongcun, Xidi has become a popular tourist spot in Anhui attracting loads of visitors during holidays and weekends. We didn’t have our own transportation and had to rely on the public transportation. As a result, we only had less than an hour of time wandering in the winding alleyways and visiting the magnificently decorated Huizhou houses of Xidi. The most prominent feature of Xidi caught our eyes at the village entrance. It was the majestic Xidi Paifang (牌坊) or Pailou (牌樓). Named as Huwenguang Paifang (胡文光牌坊), the paifang was commissioned by the Ming Emperor Wanli to celebrate the good work done by Hu Wenguang, a government official originated from Xidi. 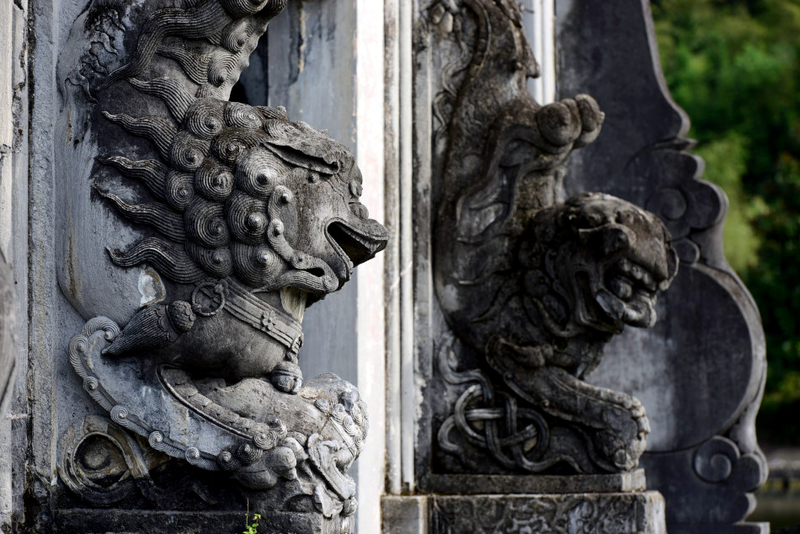 Three-tiered and four legged, the Huwenguang Paifang has become an icon for Huizhou heritage nowadays. We quickly entered Xidi through its labyrinth of alleyways. 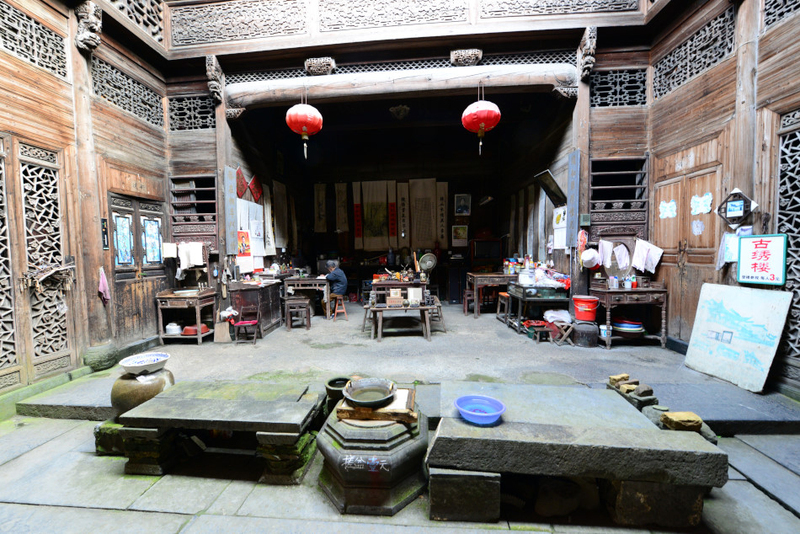 We entered a few courtyard houses along our way into the heart of Xidi, where the ancestral hall of the Hu family stood. According to some accounts, the Hu people was originally descendants from the royal family of the Tang Dynasty. After the fall of Tang, they changed their surname to Hu and gradually moved south. They found the village of Xidi in Northern Song Dynasty and became a settlement of scholars. At its heyday during the Ming Dynasty, the Hu people had turned themselves into successful businessmen, and transformed Xidi into a prosperous village. 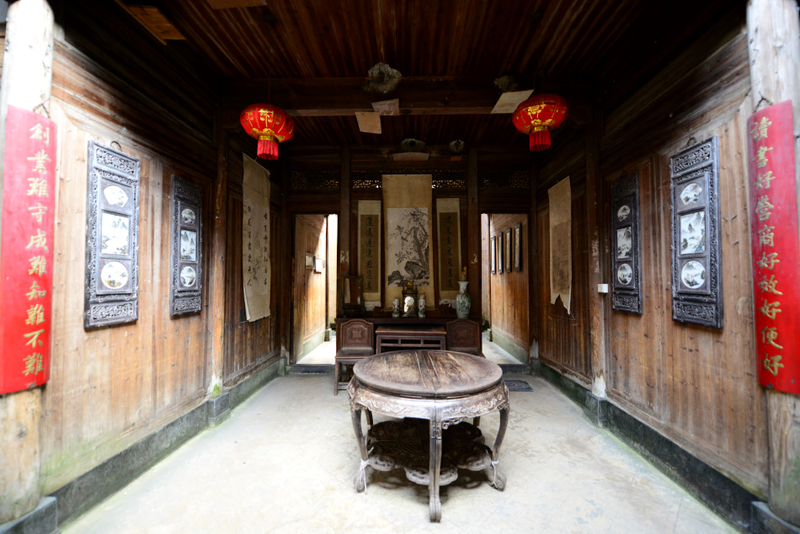 We stayed in the Ancestral Hall of Hu’s for a while, checked out the nicely decorated timber halls and courtyards, before slowly finding our way out to the exit where the last public bus would take us back to Yixian. 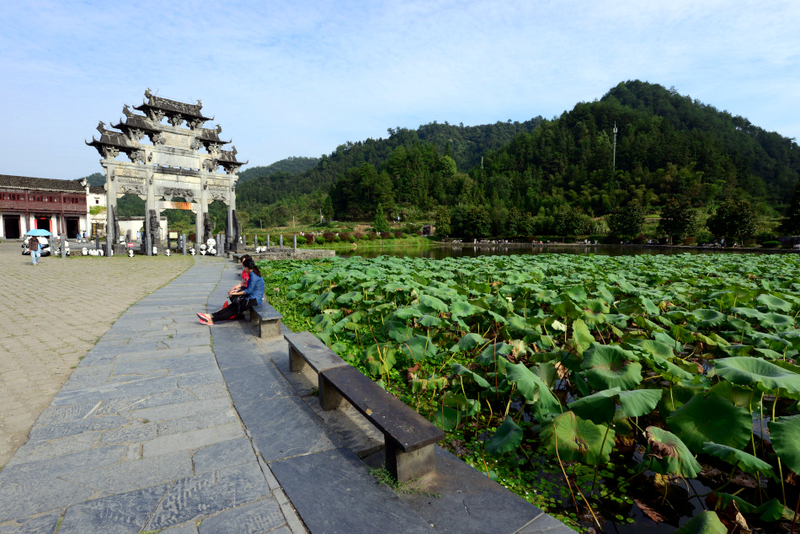 The open plaza and lily pond at the entrance of Xidi. The majestic Huwenguang Paifang, the only one of a dozen or so paifangs survived the Cultural Revolution. Stone carving details at the column base of Huwenguang Paifang. Beyond the Huwenguang Paifang lies the entrance into the village. Much of Xidi seemed like an extensive labyrinth of alleyways. Today, Xidi has become a tourist attraction. Many houses have been converted into guesthouses and restaurants. 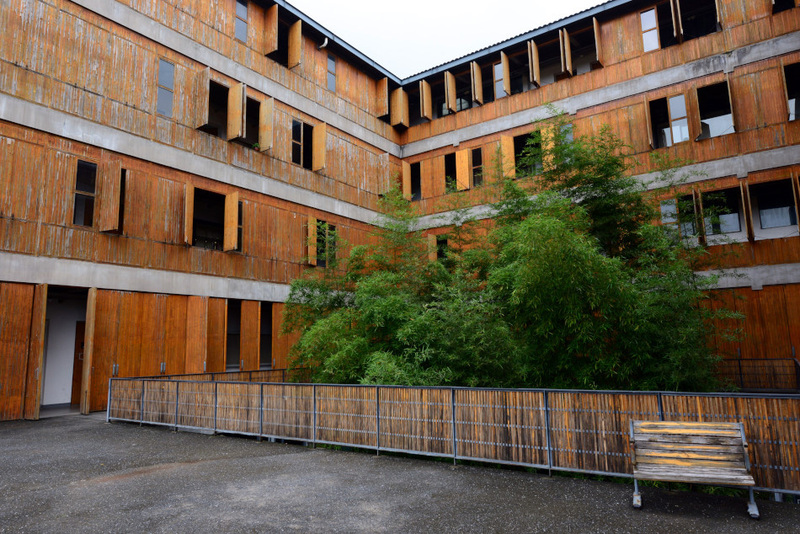 Inner courtyard or skywell of a family home with extensive wooden decorations and furniture. 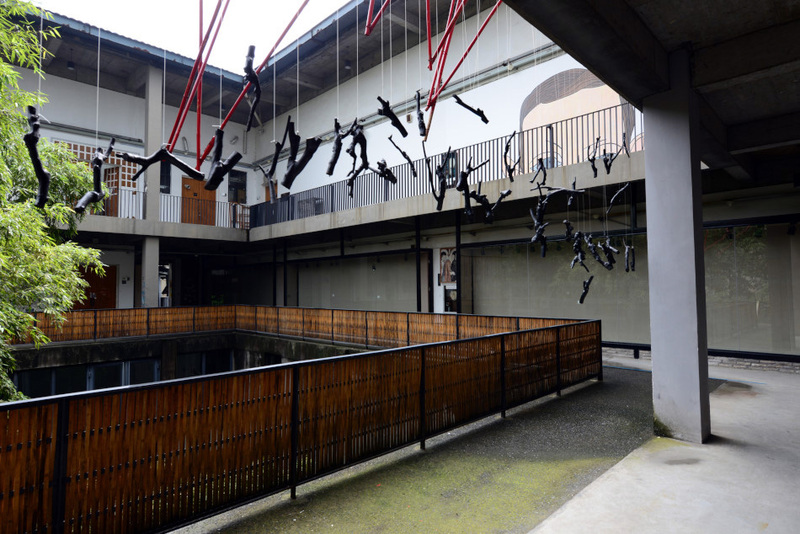 These semi-open courtyards or skywells present the lifestyle of the former residents. One of the courtyards we walked by was full of antiques. 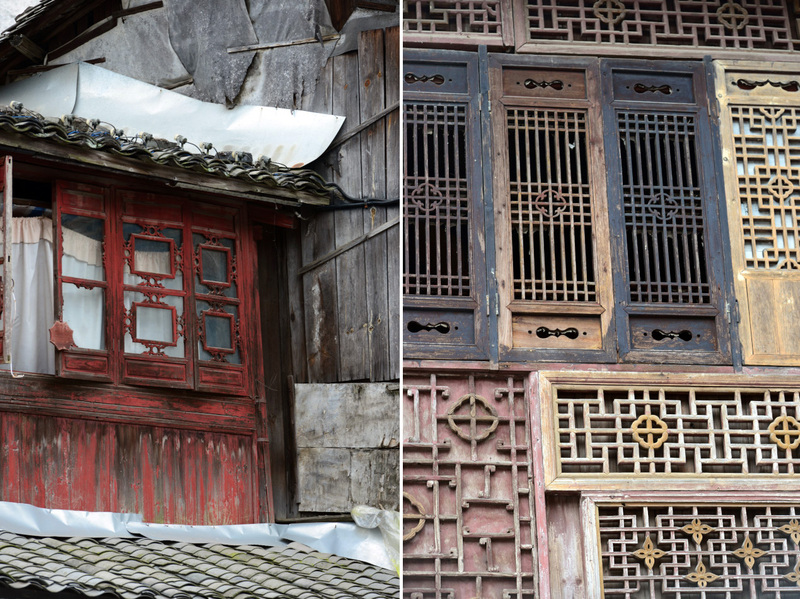 The detailed wooden carvings in each courtyard house revealed the former glory of Xidi. 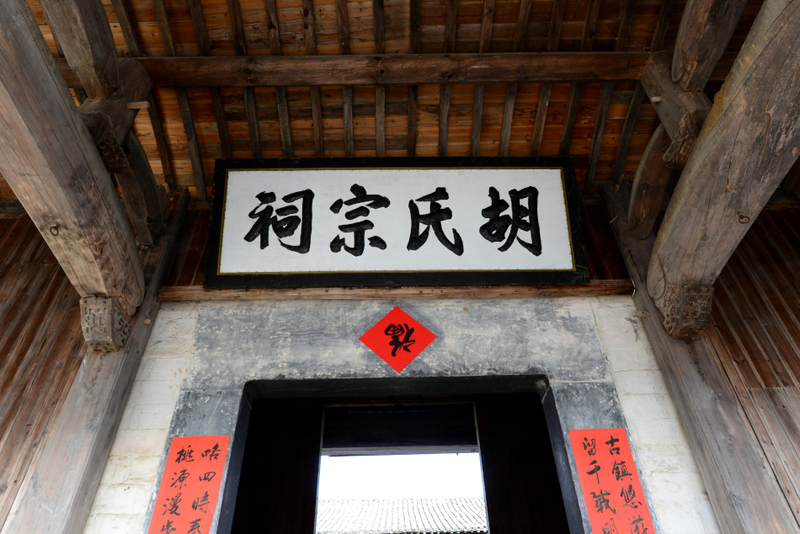 At the heart of Xidi stands the Hu’s Ancestral Hall. 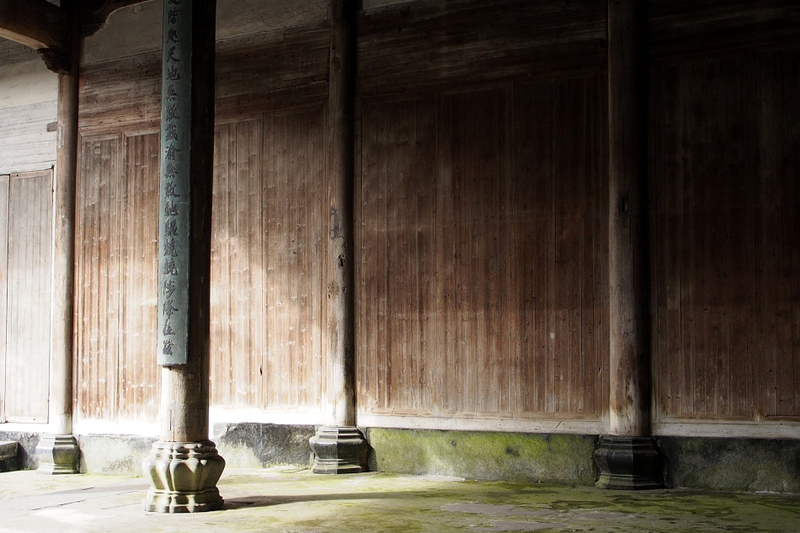 Timber columns and wall panels at Hu’s Ancestral Hall expressed an image of harmony. 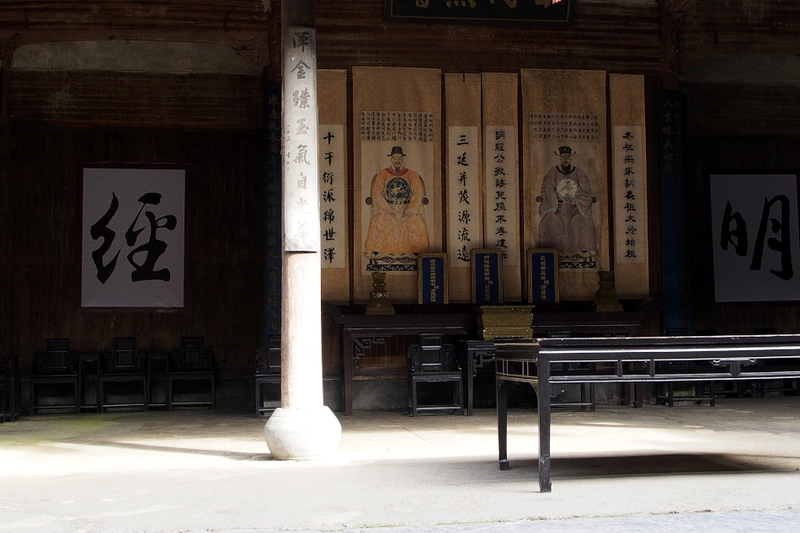 The courtyard of Hu’s Ancestral Hall was the biggest we visited in Xidi. 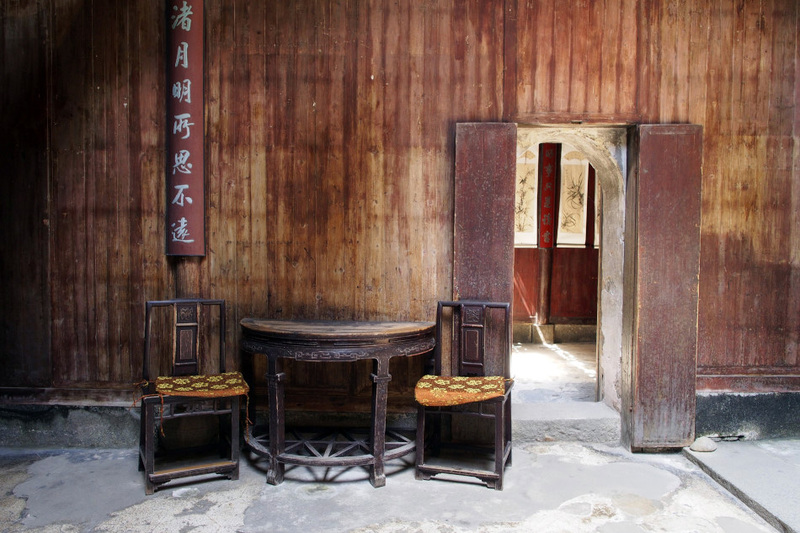 Wooden furniture and traditional portraits were some of the most remarkable features in the courtyard of Hu’s Ancestral Hall. 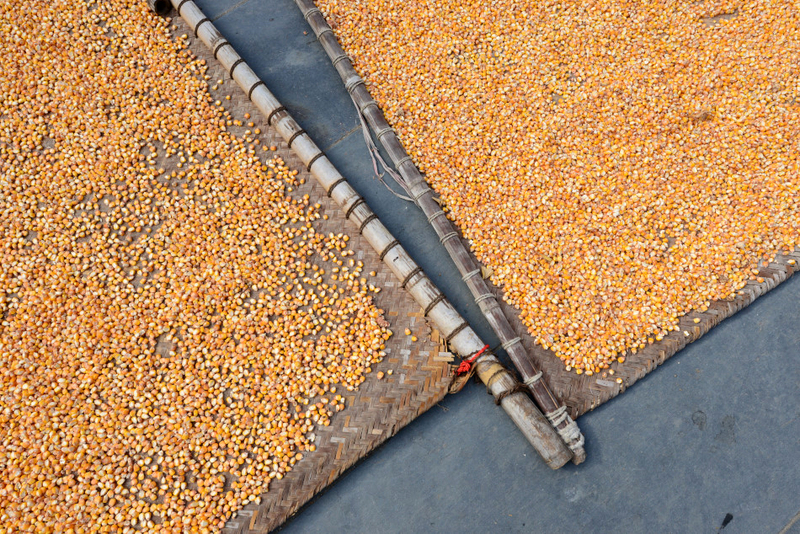 Villagers were using the forecourt of Hu’s Ancestral Hall for drying their agricultural produces, such as corn. 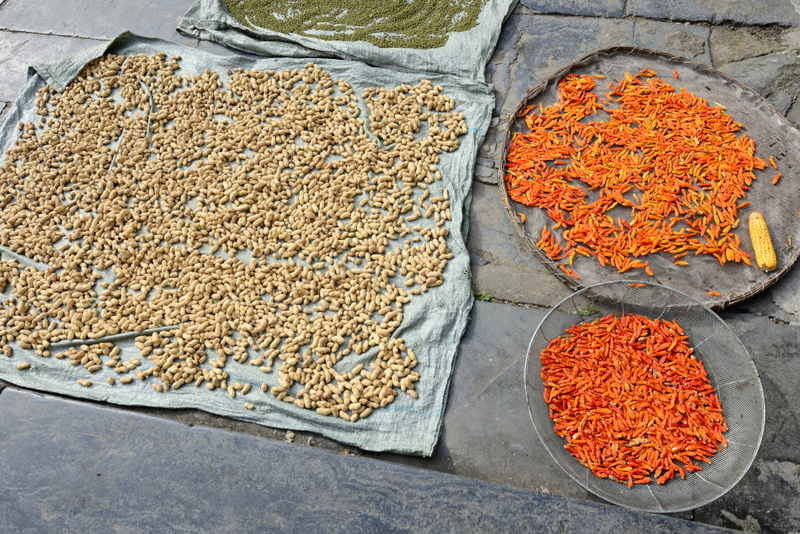 Sun-dried peanuts and chili peppers. 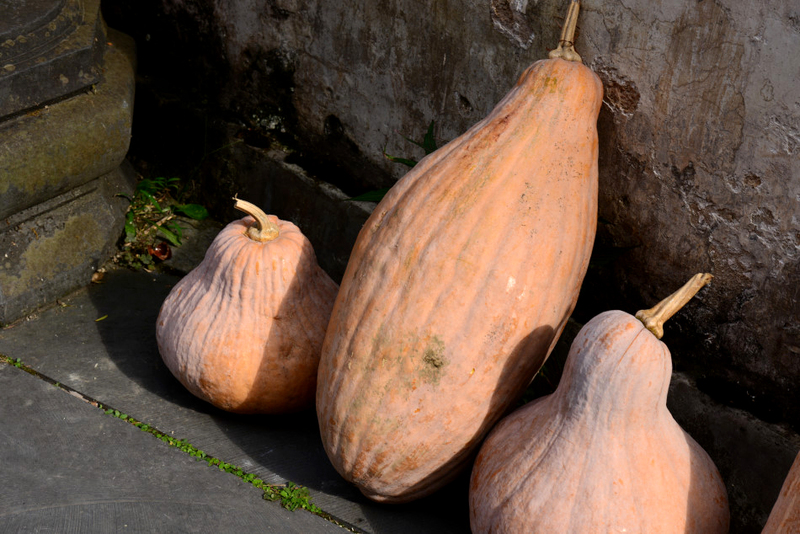 Near the exit of Xidi we passed by several squashes standing against the wall of a white washed wall. In year 2000, the sleepy village of Hongcun stepped up onto the international stage after it was Inscribed in UNESCO’s World Heritage List, as well as appearing in a number of movie scenes of Coughing Tiger and Hidden Dragon. 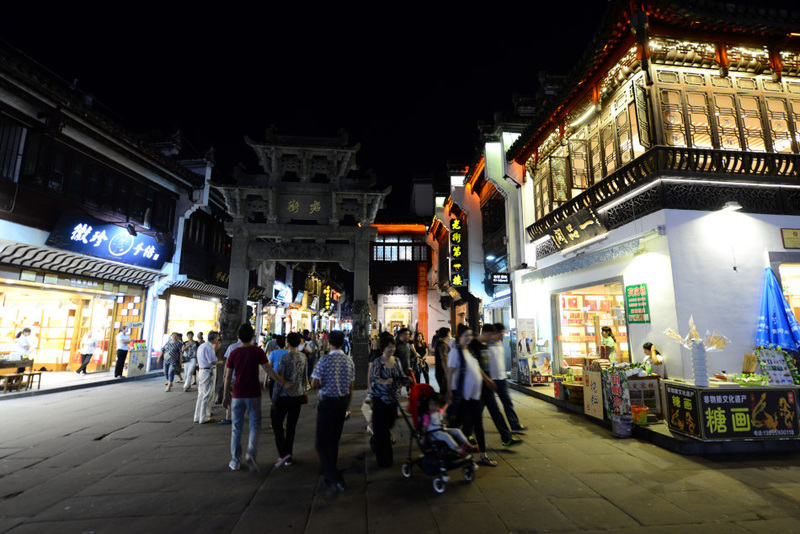 Since then, Hongcun has become a tourist hotspot in Anhui, second only to the scenic Huangshan. 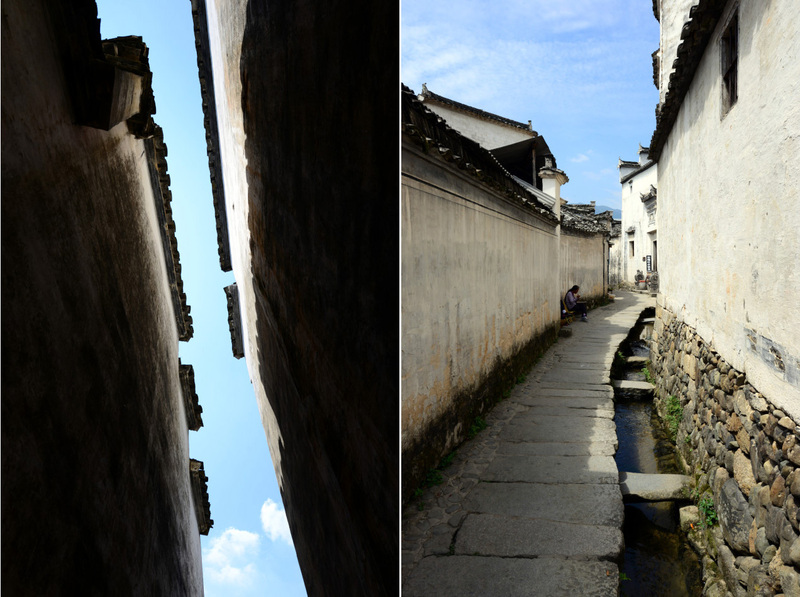 First inhabited over 900 years ago during Southern Song Dynasty, the well preserved village of Hongcun is considered one of the greatest examples of fengshui village in China. Hongcun’s layout was known as “cow” configuration, in which the village’s significant components, such its trees, water ponds, lakes, bridges, etc. were put together in an order that metaphorically resembled the shape of a cow, from its horns to legs, and stomach to intestines. In fact, the “cow” configuration of Hongcun was based on a fengshui master’s decision during the Ming Dynasty, who suggested the “cow” configuration as the perfect fit for the spirit and landscape of the site. 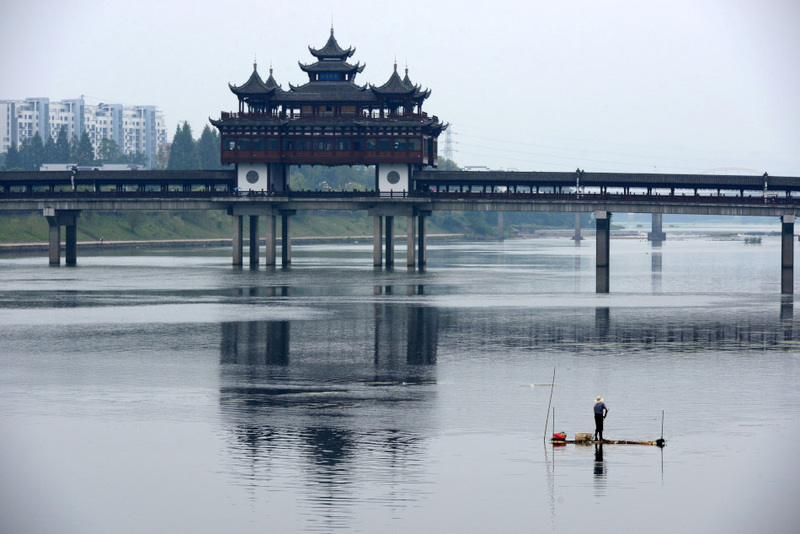 Another crucial feature of Hongcun’s design was its water network. Similar to the inner system of a cow, water was led through the entire village, passing in front of each individual home within the village boundary. Apart from daily water use, the water system also served as a means for fire safety and micro-climate control. 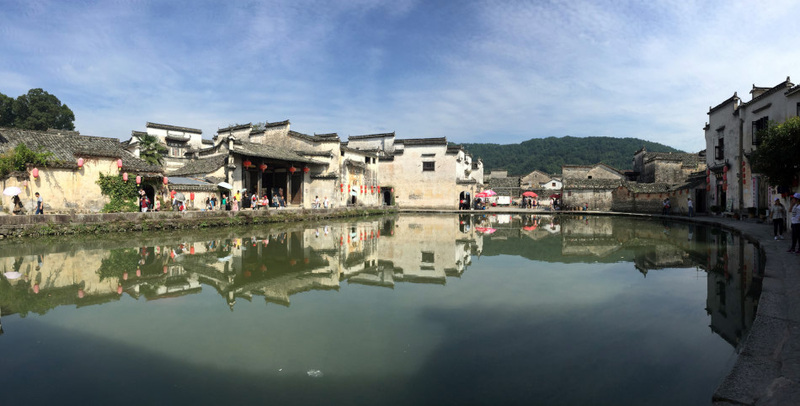 The Moon Pool (月塘/ 月沼) at the village centre, referred as the cow’s stomach, and the South Lake (南湖), referred as the cow’s belly, served as the two filtering water bodies before water returned to the natural river system outside Hongcun. 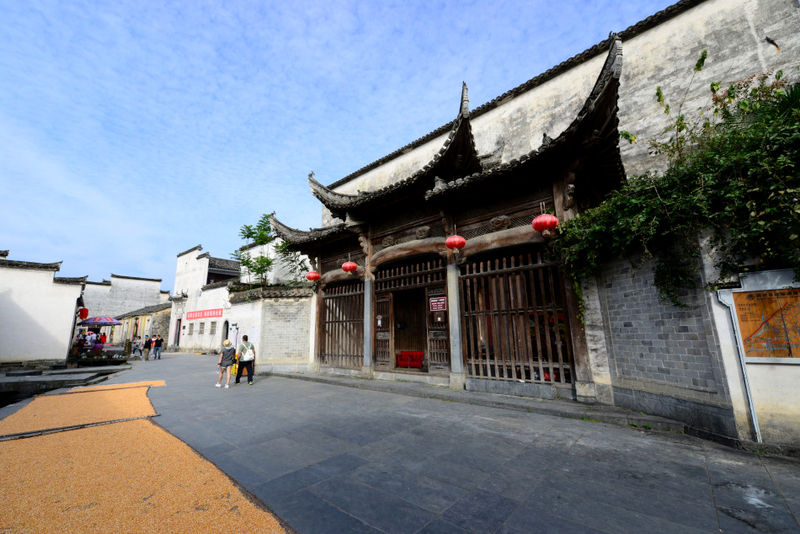 Apart from its fengshui and water system, Hongcun is also well known for its well preserved Huizhou (徽州) architecture. Huizhou was a historical region in China, encompassing Southern Anhui and Northeastern Jiangxi. Just as the Laojie of Tunxi, Huizhou architecture in Hongcun are mainly building complexes made of white washed walls and dark tiled roofs. 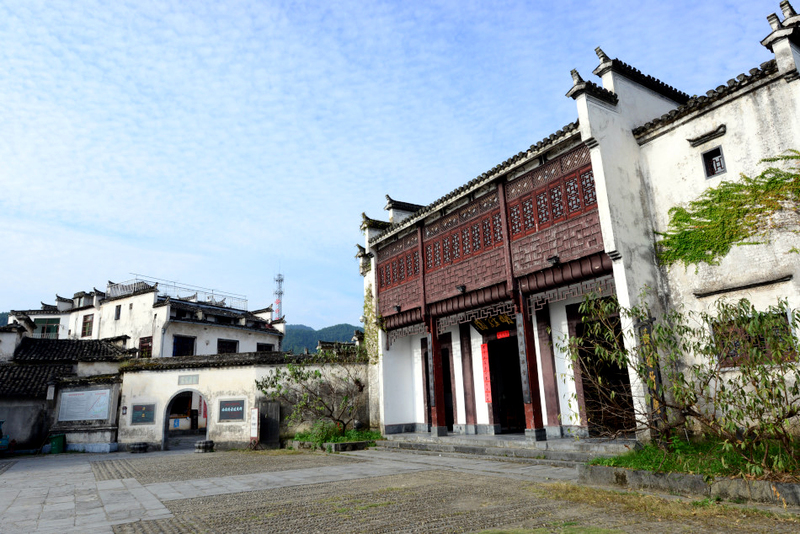 While most of Huizhou architecture at Tunxi’s Laojie are shops and mixuse buildings, in Hongcun there are all kinds of Huizhou buildings preserved, from courtyard homes to ancestral halls. Located in Yi County about 85km from Tunxi, Hongcun is easily accessible by public bus. From Tunxi, we took a bus to the nearby town of Yixian, where another local bus took us for the last 10km to reach Hongcun. It was a Sunday. We arrived at the South Lake (南湖) of Hongcun in mid-morning and were immediately overwhelmed by the sheer amount of local tourists and art students arrived before us. In the mirror perfect reflection of Hongcun and its picturesque arch bridge, we could the magnificent Huizhou architecture, blue sky, waterlilies and groups after groups of tourists entering the village. In an attempt to avoid an over-touristy “theme-park” experience, after we crossed the bridge of South Lake we immediately found our way through a series of narrow alleyways some way off the central path where most tourists entered the village. Once inside, wandering around the crisscross alleyways leading to the Moon Pool (月塘/ 月沼) proved to be a much enjoyable experience. At a courtyard house converted guesthouse, we enjoyed a local meal with fresh taste of the countryside. 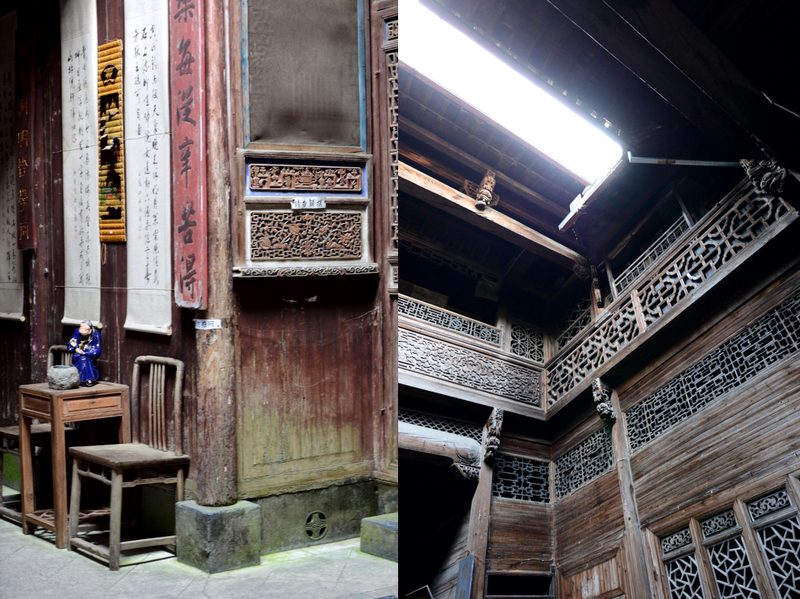 Visiting some of Hongcun’s fascinating courtyard complexes and ancestral halls filled with exquisite wooden carvings and antique furniture was definitely memorable. Although quite a number of houses in Hongcun had been converted for tourist businesses, some original villagers still remained in the village, and could be seen doing laundry at the Moon Pool, or washing rice at water channel in front of old courtyard houses, or drying herbs and flowers along the village alleyways. Art students gathered along the shore of South Lake with their easels, paper and colour plates. Through compositions of colours and strokes, each student had a different expression of Hongcun. The stone bridge crossing the archer-bow shaped South Lake provides an elegant entry into Hongcun. During our visit, there was a long queue crossing the bridge. The natural setting of Hongcun is picturesque. The South Lake produced perfect reflections of the Huizhou buildings and the surrounding scenery. 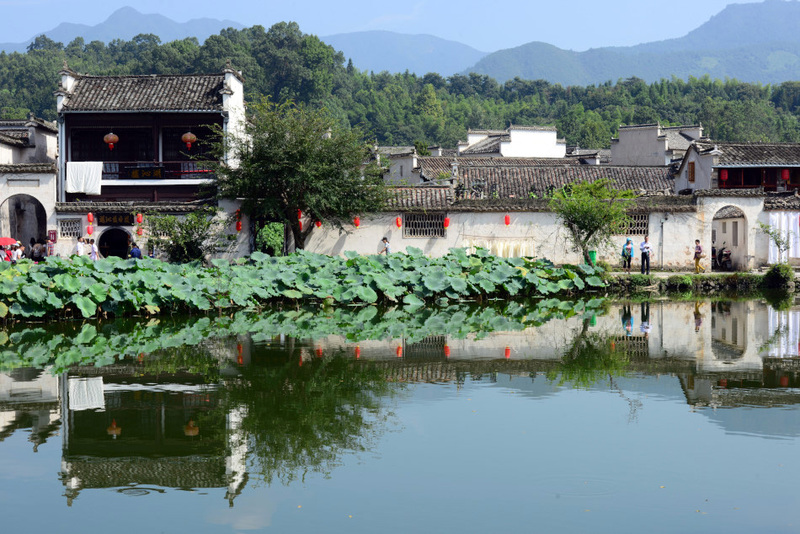 Huge water lilies were planted at the entrance of Hongcun. Narrow lanes crisscross the entire village. Getting lost in the network was an enjoyable experience. 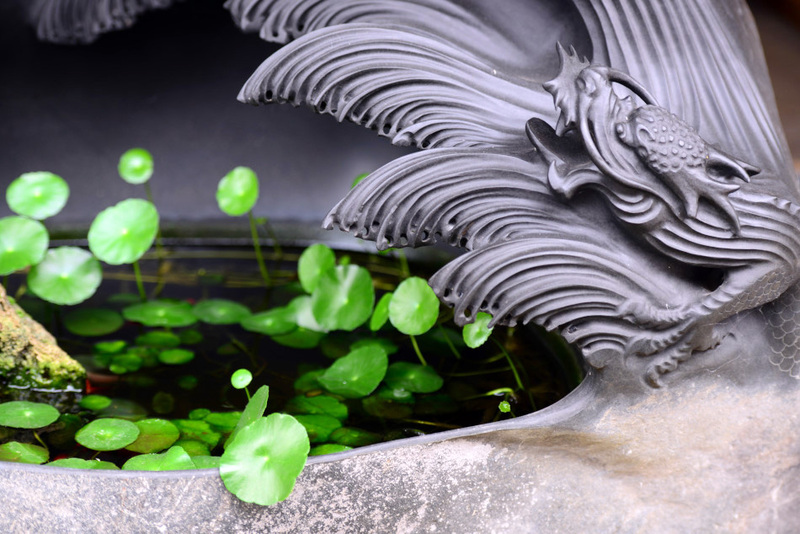 The magnificent Moon Pool was the focal point at the heart of Hongcun. Because of its beauty, the Moon Pool was also a magnet for tourists. 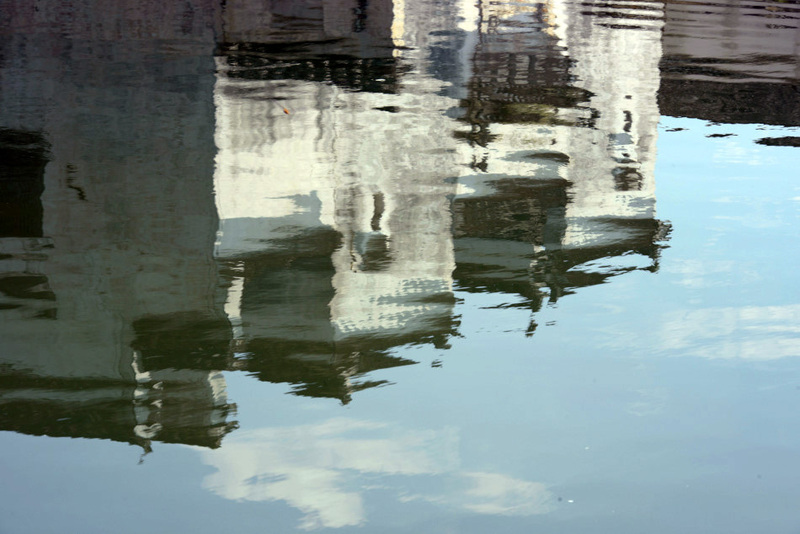 The reflection of Huizhou architecture in the Moon Pool resembled a great Impressionist painting. 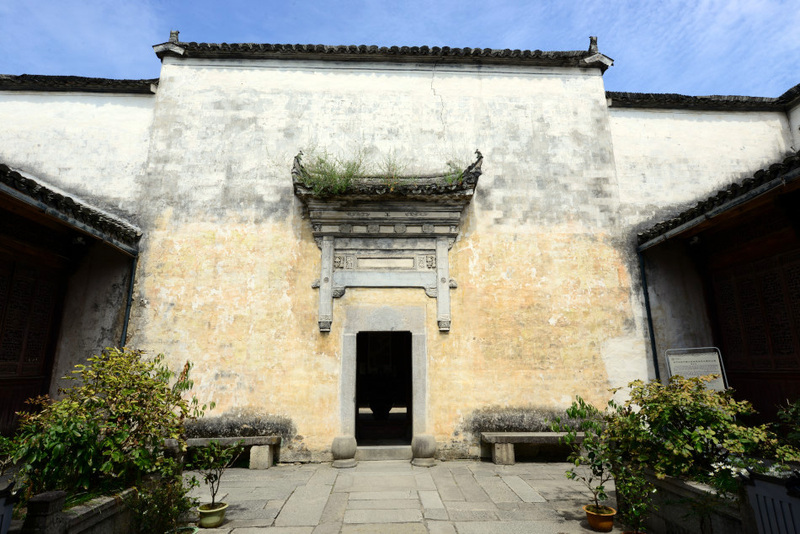 Built in 1403, the Wang’s Ancestral Hall or Lexu Hall (樂敘堂) was the architectural gem along Moon Pool. 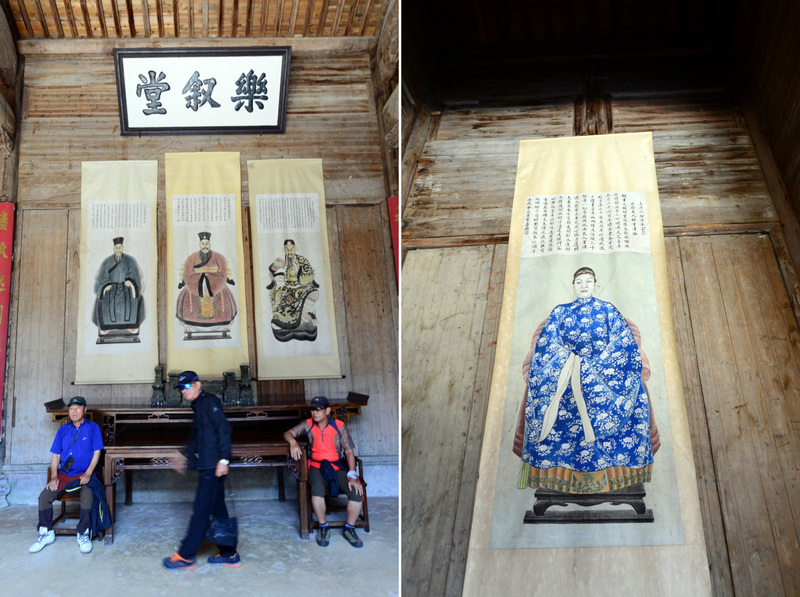 Portrait paintings at the semi-open guess hall of Lexu Hall (樂敘堂). 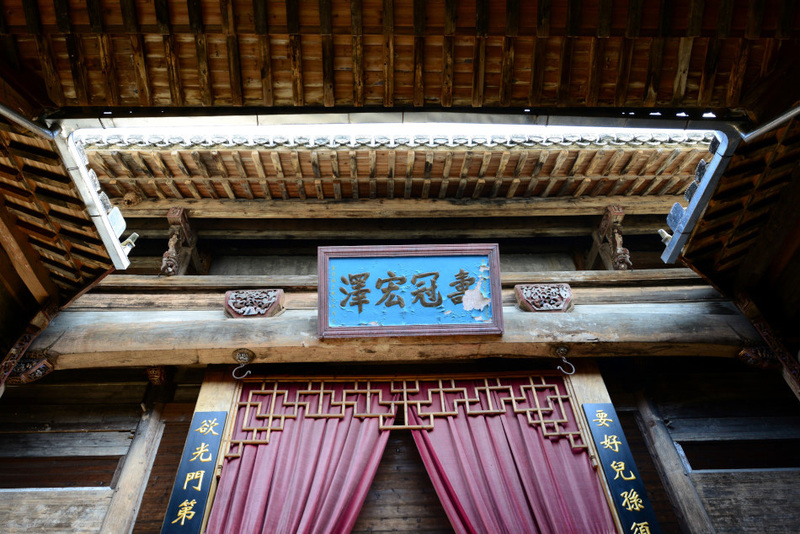 The well-preserved wooden architecture could be seen throughout Lexu Hall, including the inner ancestral hall. 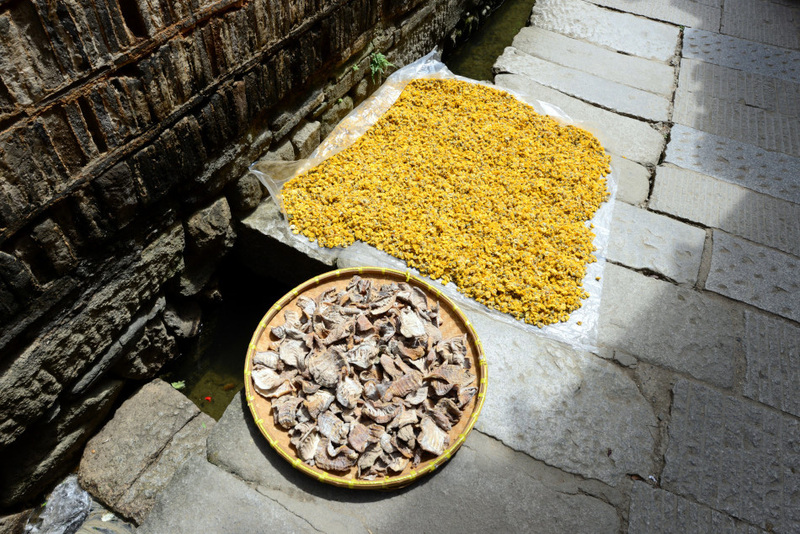 Fed by water diverted from Jilin Stream which originates from a spring in the hillside behind the village, Hongcun’s intestinal network of water channels runs past the front of each house. 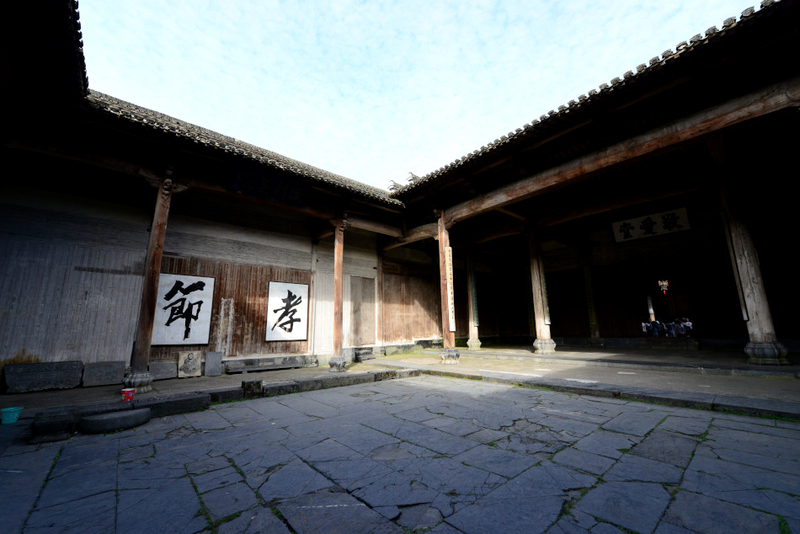 Chengzhi Hall (承志堂), a historical home of a wealthy business in the Qing Dynasty, is another famous complex in Hongcun. 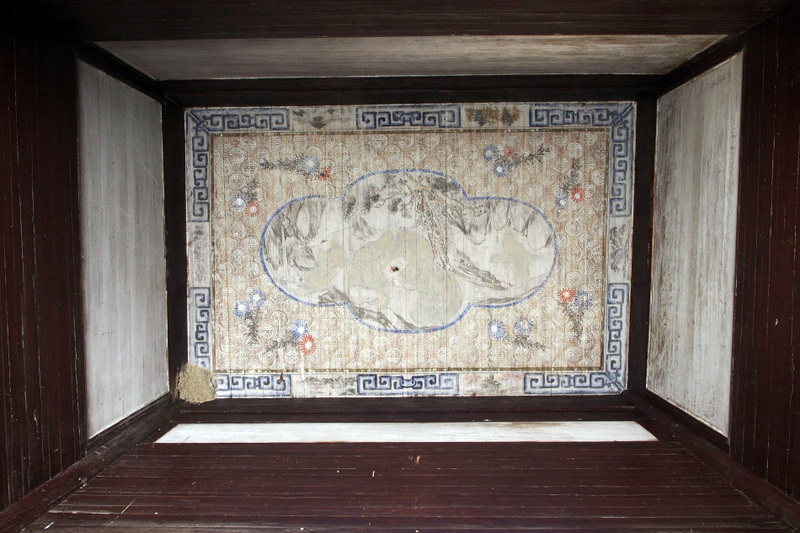 Built in 1855, Chengzhi Hall is famous for its Huizhou architectural details, including painted ceilings. 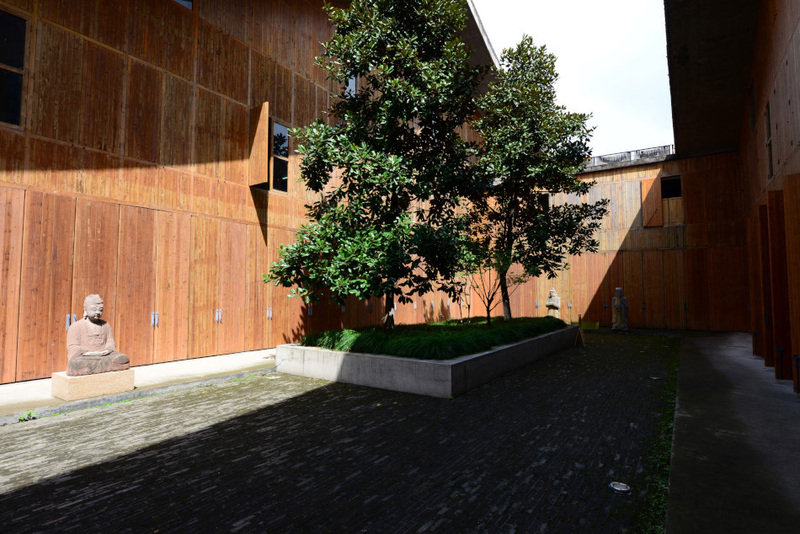 Chengzhi Hall’s most fantastic feature is undoubtedly its wooden carvings. Inner courtyard of Chengzhi Hall. Semi circular table and the antique chairs revealed the social habit of the former dwellers. 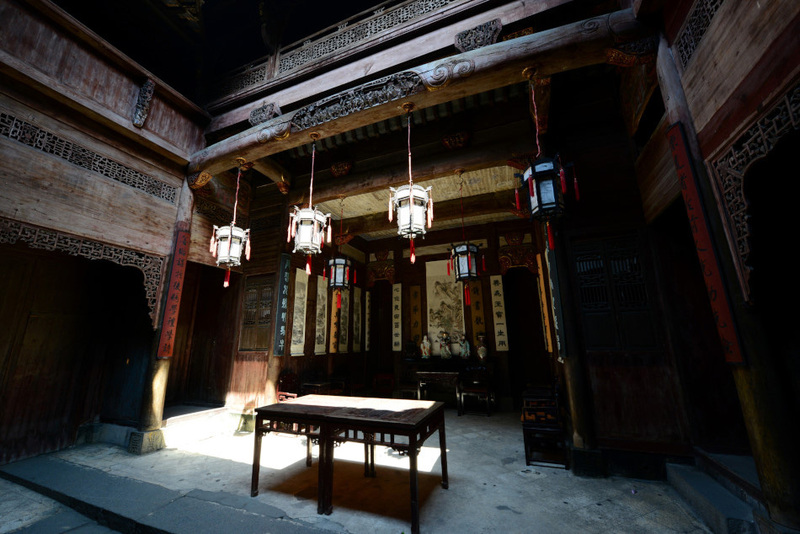 In Chengzhi Hall, there is a quiet chamber and private courtyard belonged to the former treasurer of the family. 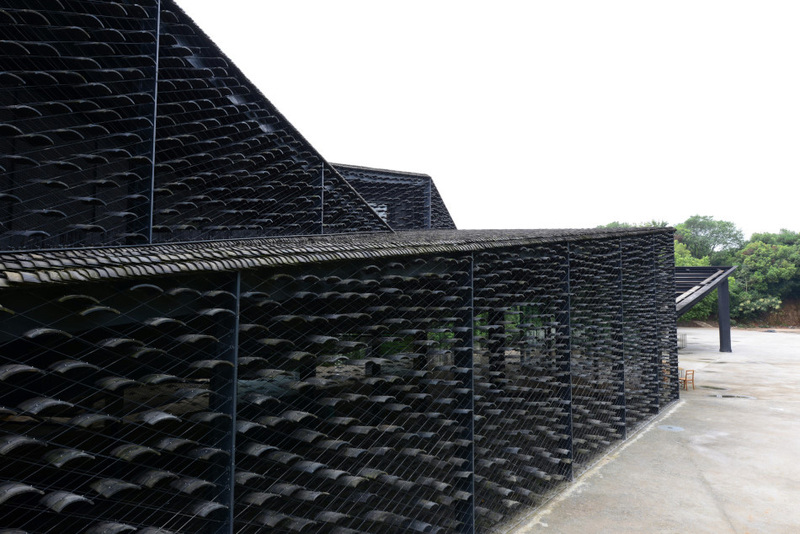 It was designed according to fenshui for “keeping the money from flowing out of the house”. Water was led into this corner of the complex and entered a fish pond. The wooden balcony overlooking the fishing pond reminded visitors even the treasurer could enjoy a pleasant living environment along with the host family. Hongcun is still inhabited by local residents. We get a glimpse of the local life from the hanging laundry and sun-drying herbs and flower buds in the alleyway. In the afternoon, many tourist groups were gone. The village regained its tranquility. 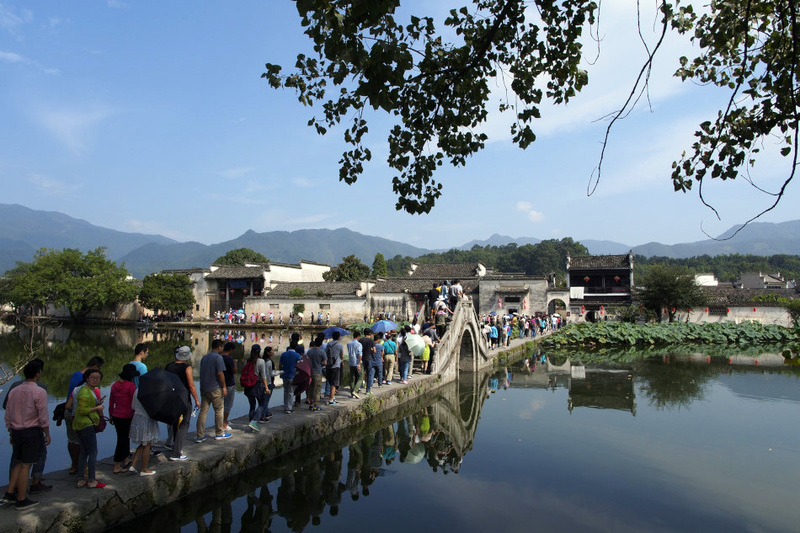 Standing on the narrow stone bridge at South Lake, the picturesque Hongcun appeared in perfect harmony with nature. 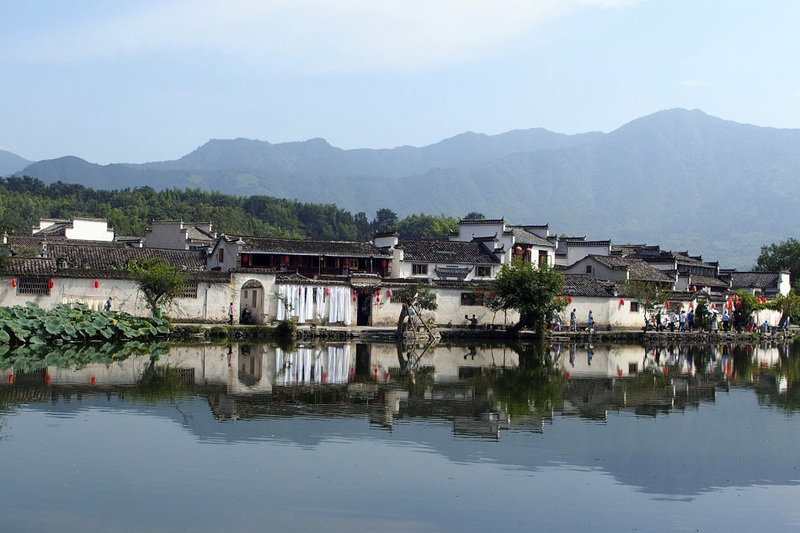 If we have a second opportunity visiting this lovely village again, we will definitely choose to spend a night in Hongcun in order to truly appreciate its rural beauty in the harmonic serenity of water and sky. With its extensive waterway and transportation network, Tunxi (屯溪) has long been a trading centre in the Anhui region since ancient times. Today, it also serves as a good base for visiting the two UNESCO world heritage sites in Anhui, Huangshan (Yellow Mountain) and the Huizhou villages. 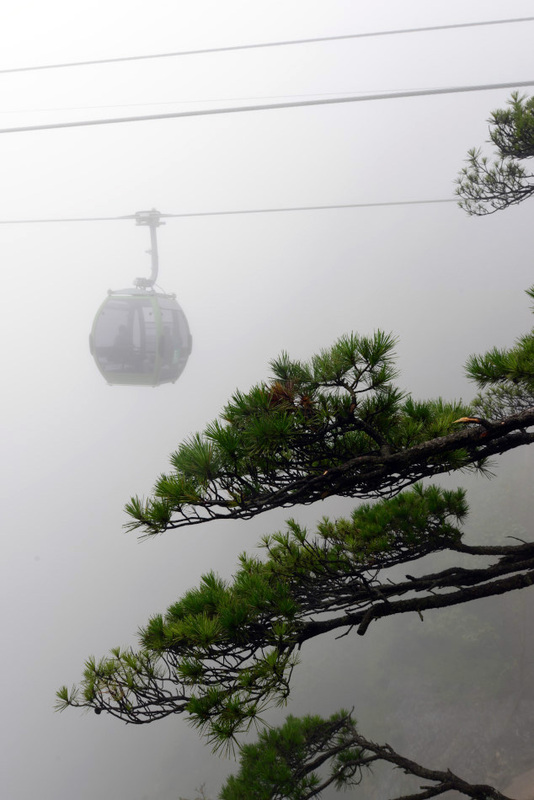 Also known as Huangshan City (Yellow Mountain City), Tunxi is conveniently connected to the mountain trailheads and the cable car terminals at the mountain foot with frequent buses. 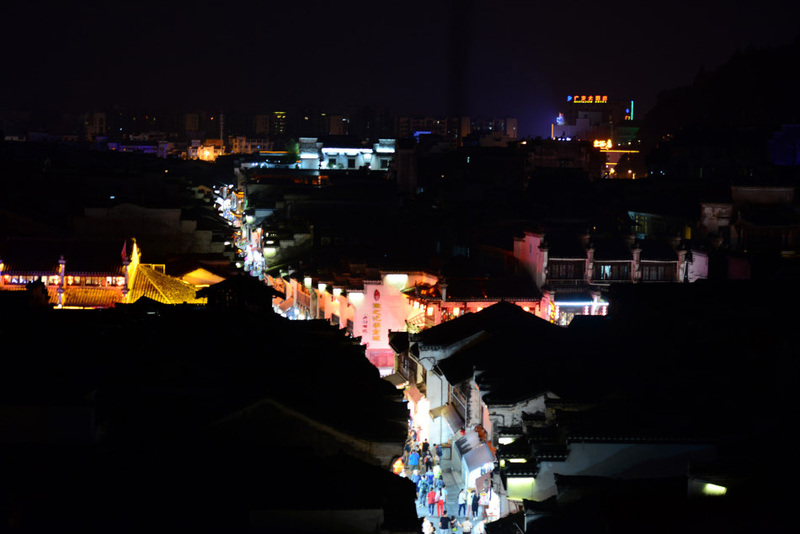 At the heart of the old town is the well preserved historical main street simply called Laojie or Old Street (老街) which is about 1.27km long running in the east-west direction. Laojie reached its heyday in the Qing dynasty when it served as a commercial hub for businesses, especially tea trading. 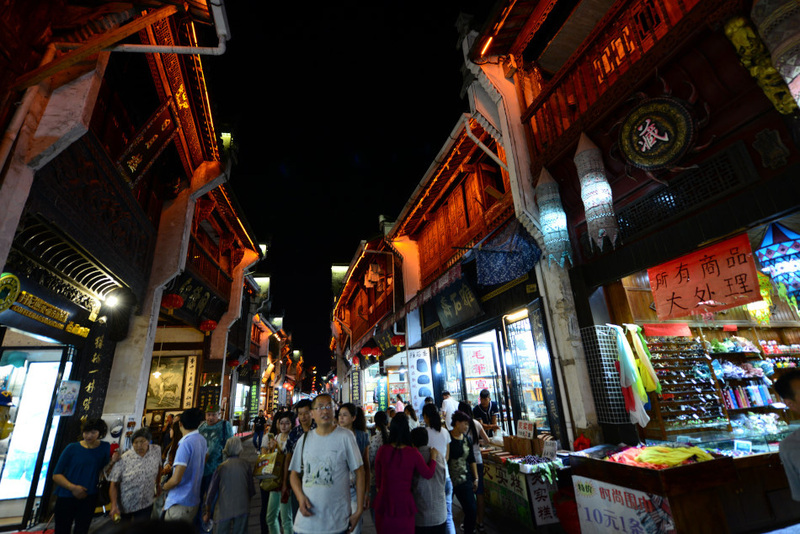 Today, Laojie has become a popular souvenir street, serving tourists heading to and from Huangshan. 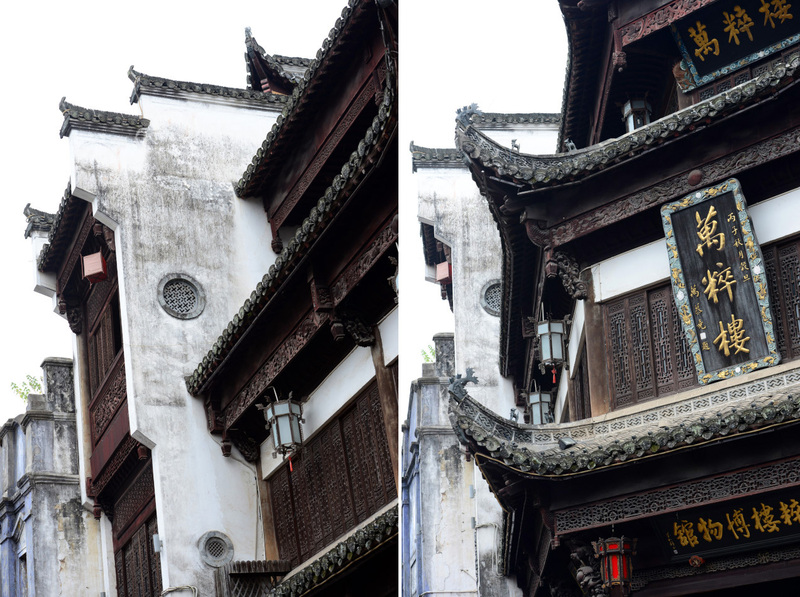 Timber buildings and restored Huizhou buildings with white washed walls flanked both sides of the pedestrian street. Vendors sell all kinds of souvenirs from the region, such as tea leaves, ink-stones, chili sauce, etc. 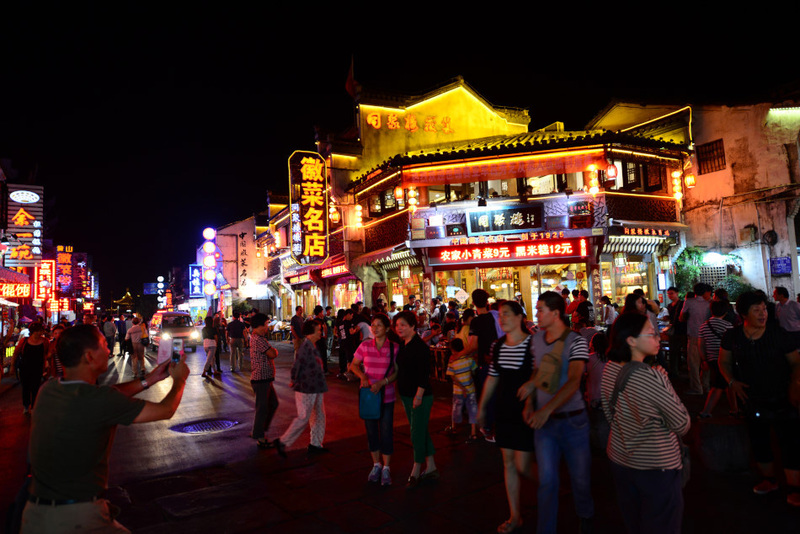 At night, vivid lighting and vibrant retail activities lit up the old buildings of Laojie, enhancing the enchanting atmosphere of the pedestrian street. The Laojie of Tunxi offered us an introduction to Huizhou (Anhui). For two nights the Youth Hostel at Laojie provided us a comfortable base to explore the unique architecture, food, and culture of the region. 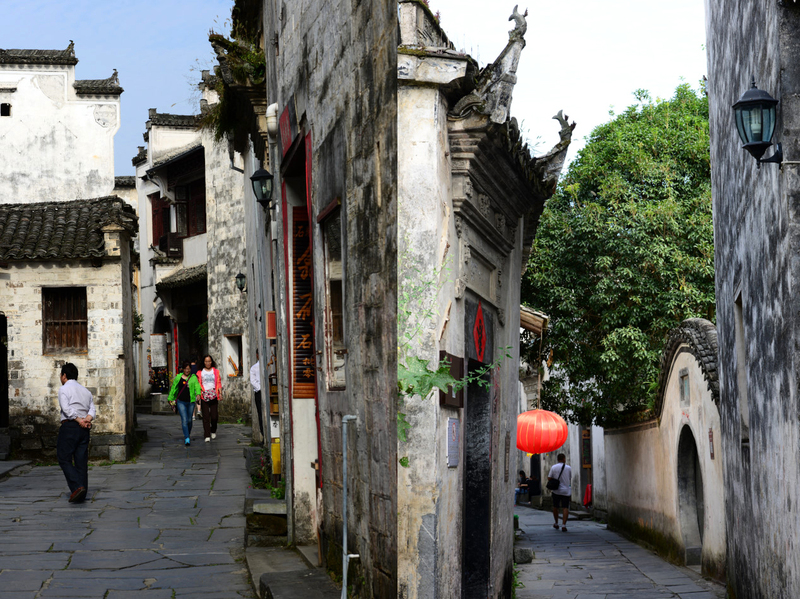 With its white washed walls and dark tiled roofs, Laojie remains as a showcase of traditional Huizhou architecture in Anhui. Timber panels are still being used as shop gate along Laojie. Some of the better preserved buildings have been converted into museums. 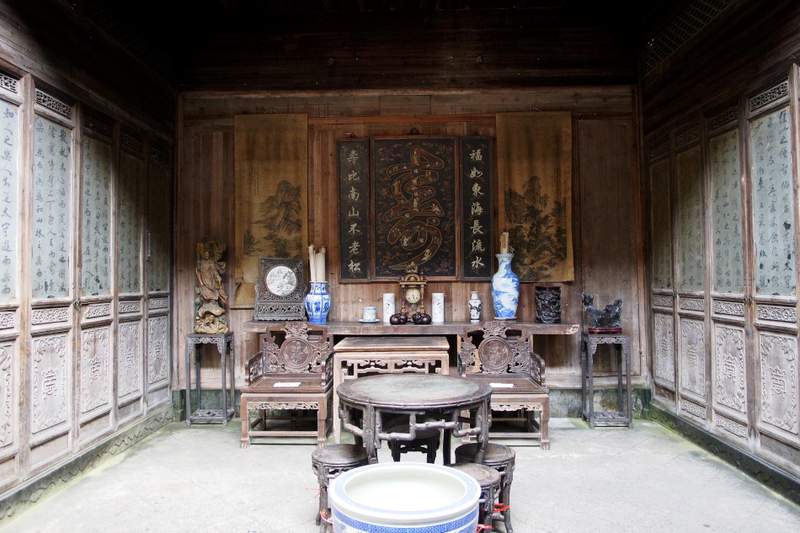 Wancuilou (萬粹樓) Museum has a display of private antiques collections. Timber lattice and traditional window designs were still common sight along Laojie. 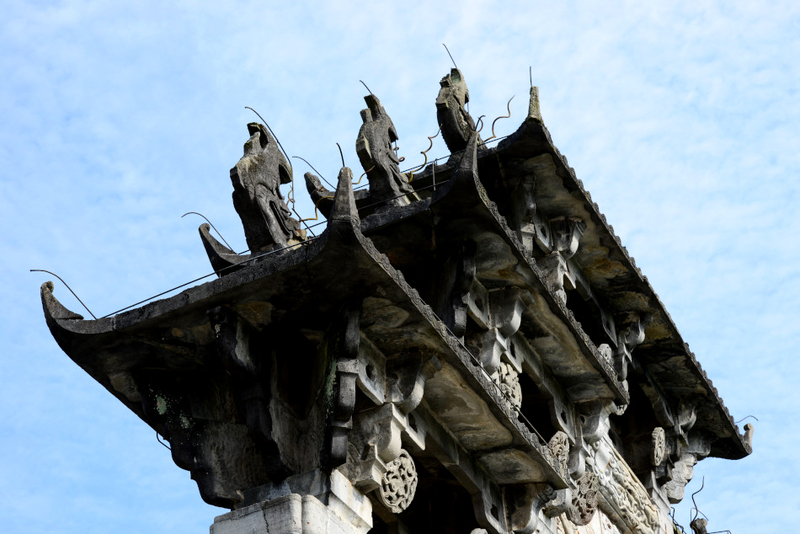 Apart from wooden lattices, roof tiles also played a significant role in traditional Chinese architecture. 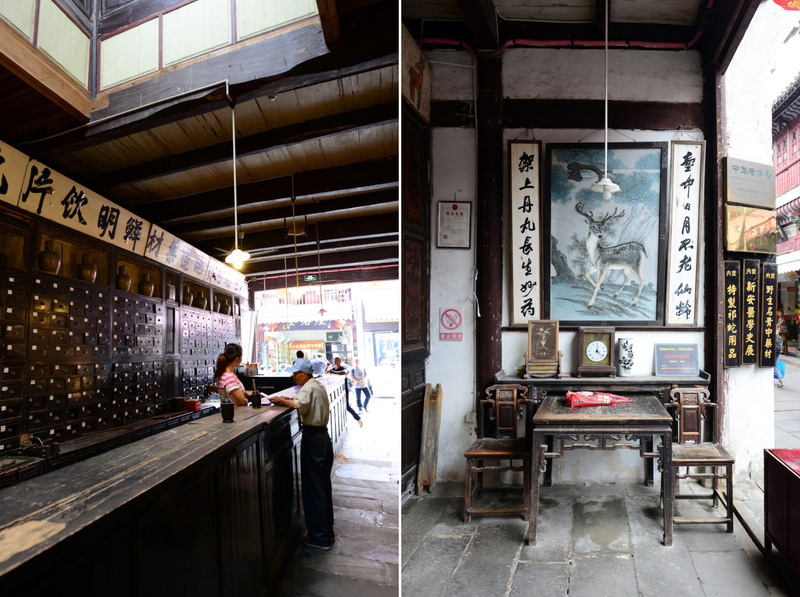 Vendors selling all kinds of souvenirs from traditional paper to spicy sauce revealed what Anhui is well known of among local tourists. Vendors of candy fruits and handcrafted hair combs with animal bones. For us, the century-old herbal medicine shop was one of the most attractive shops at Laojie. Meishi Renjia (美食人家 ) is a popular restaurant near the entrance of Laojie. 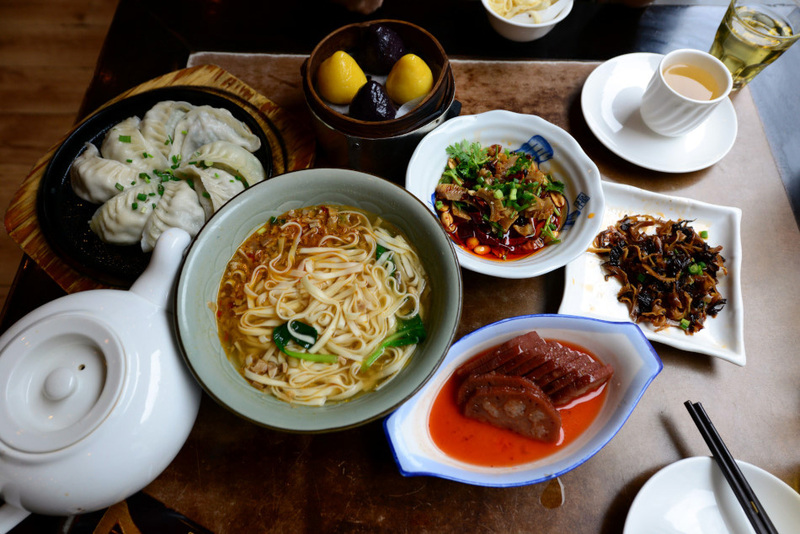 We tasted a number of local dishes including dumplings, handmade noodle with meat+bean sauce, bamboo shoot salad and stuffed lotus root with sweet sticky rice in osmanthus syrup. A restaurant specializes in Huizhou cuisine has a little booth at the front of the restaurant selling fried hairy tofu (毛豆腐). 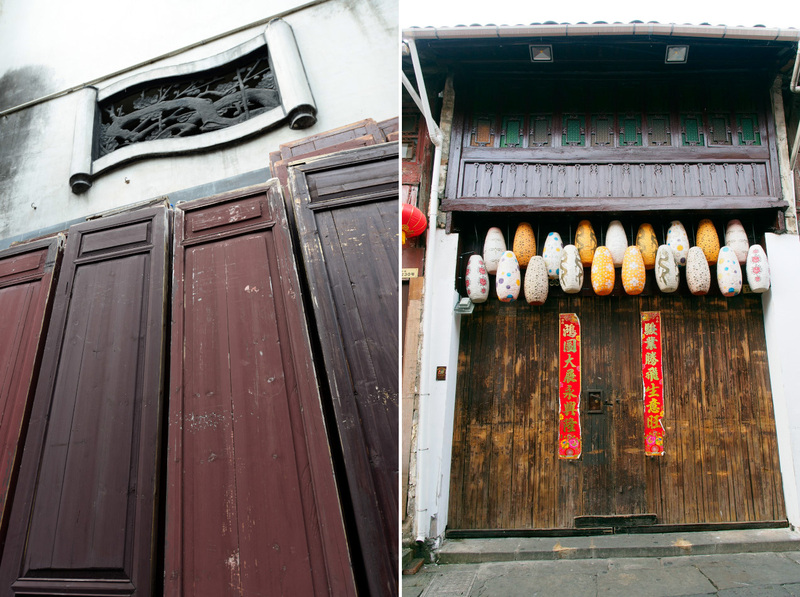 In the midst of traditional Huizhou architecture, two buildings stood out with their western touches. One of the buildings was decorated with a communist star and the washes of old blue paint on other one revealed the building’s past glory and uniqueness. 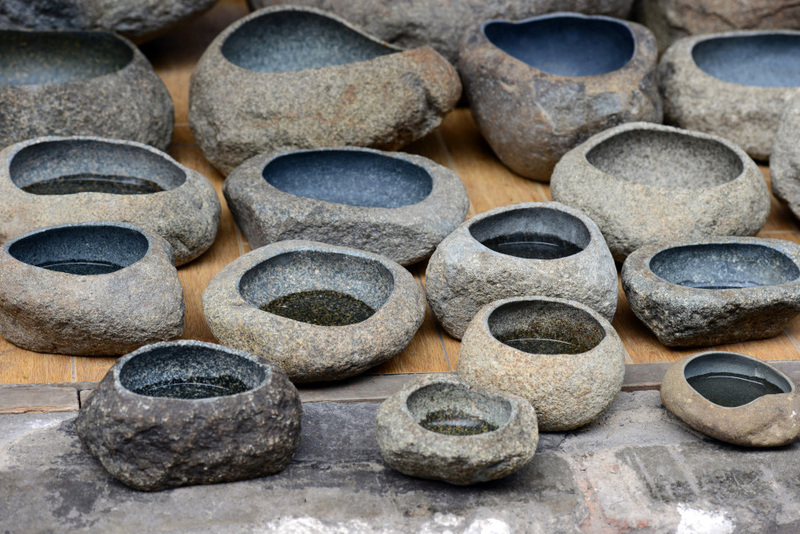 Stone products such as these bowls are popular here. Despite writing with ink and brush is no longer popular nowadays, the famous She inkstone (歙硯) from She County in Anhui with meticulously carved figures remain as a popular souvenir from the area. 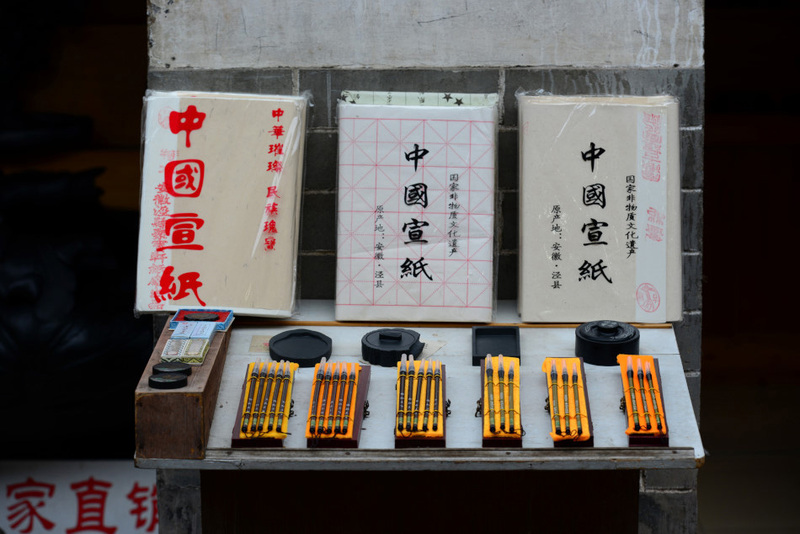 Other than inkstones, Chinese brushes and xuan paper are among the most popular souvenir available in Laojie. Xin’an River lied in south of Laojie, where a local fisherman was testing his luck. 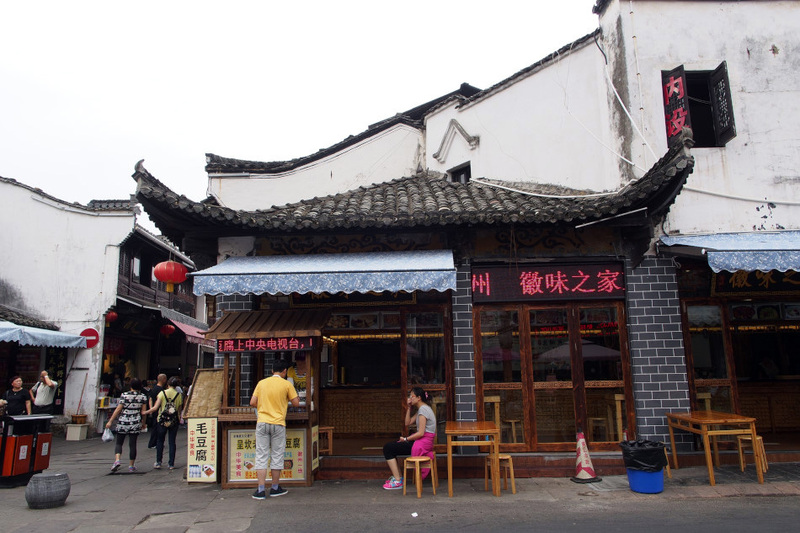 There are many restaurants serving Huizhou cuisine in the Laojie area which makes Laojie easily become a popular place for social gathering. Most shops were open till late at night. The entrance gateway of Laojie is a popular gathering place for tourists and the locals. This is the view of Laojie from our hostel window. The street remained active until late at night.